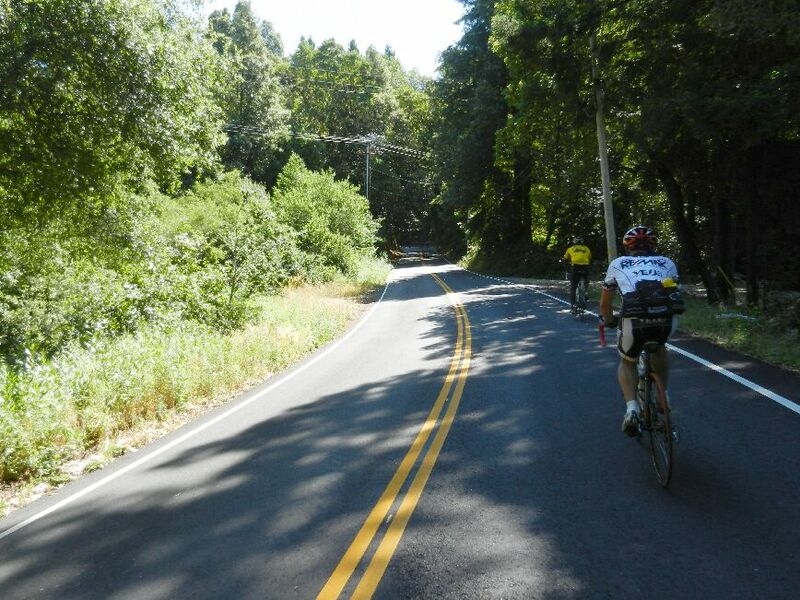 This years’ Santa Cruz Mountains Challenge (SCMC) is the 13th annual event put on by the Santa Cruz County Cycling Club (SCCCC). 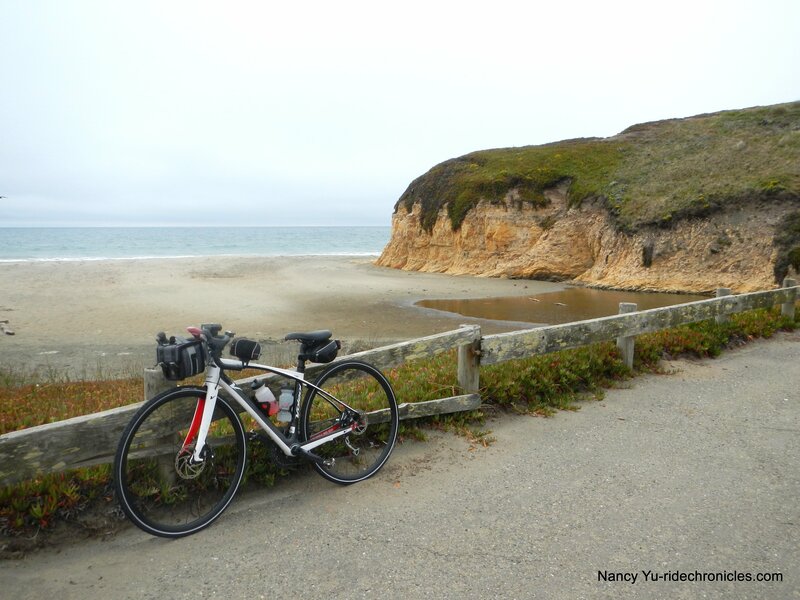 There are three challenging routes to choose from: the Double Metric/124 miles, the Century/100 miles and the Metric Century/62 miles. 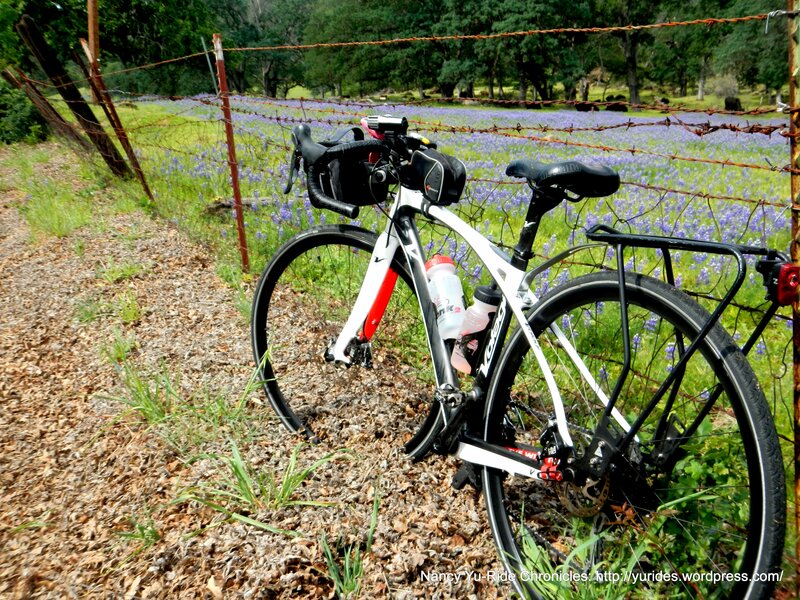 All the featured climbs are on country back roads with minimal traffic. 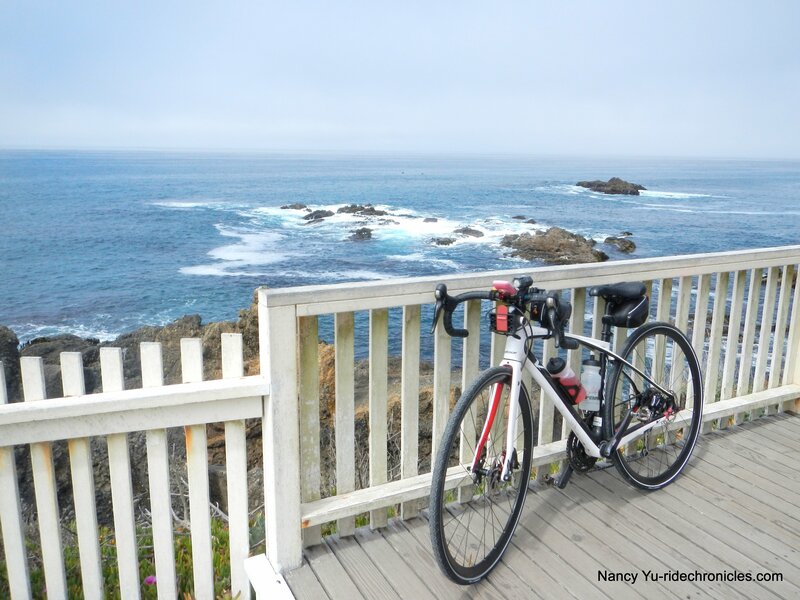 Michael and I signed up for the Century route; this course takes us from the redwoods to the ridge tops of one of California’s most gorgeous and scenic areas. 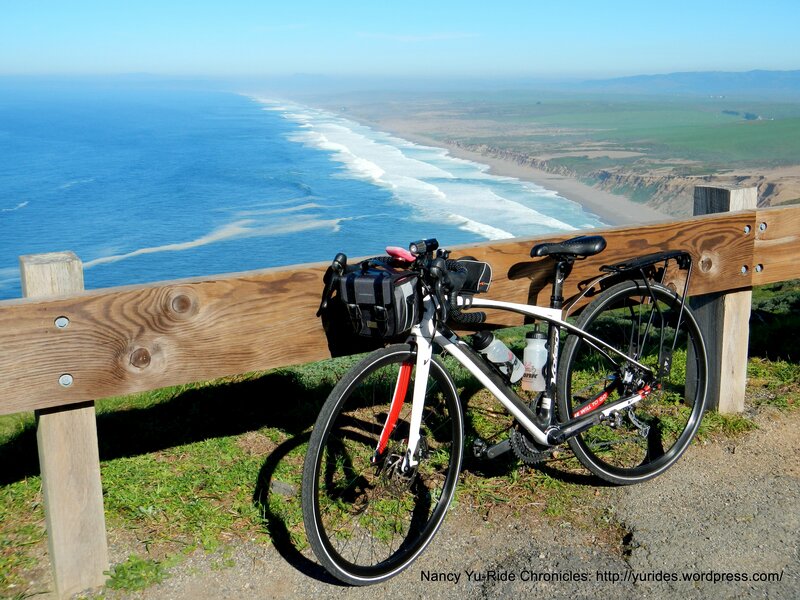 The challenge is gaining over 11,000′ in elevation within the 100 miles. 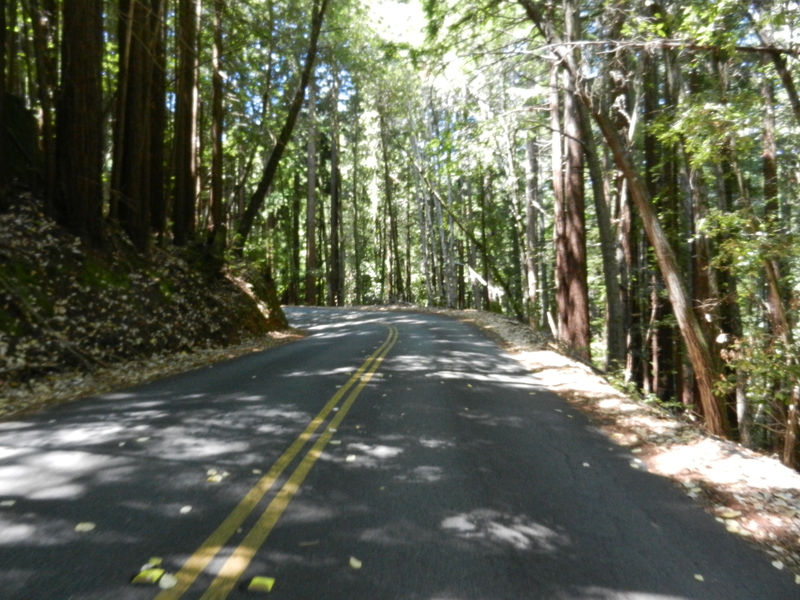 The classic climbs on this course includes the famous Mountain Charlie Rd, Jamison Creek Rd and Zayante Rd. 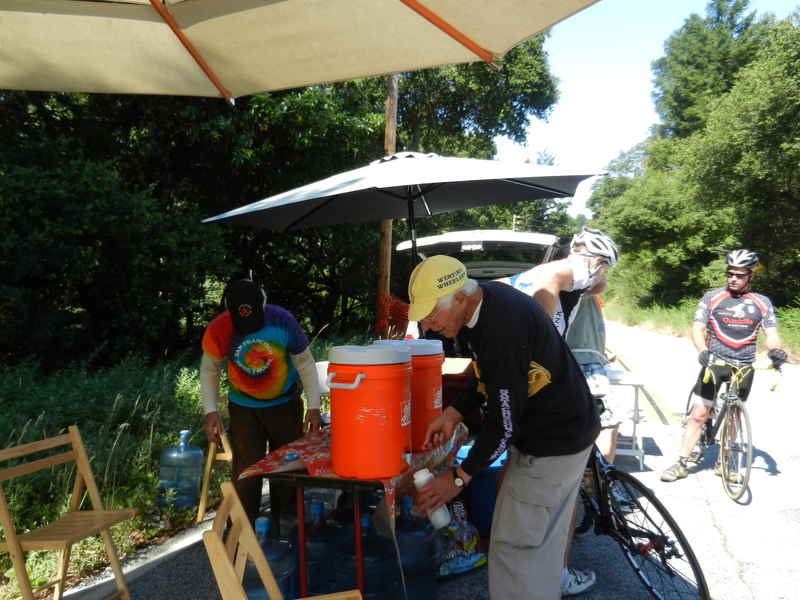 SCCCC provides 4 rest stops along with several water stops conveniently located at the top of most of the climbs. 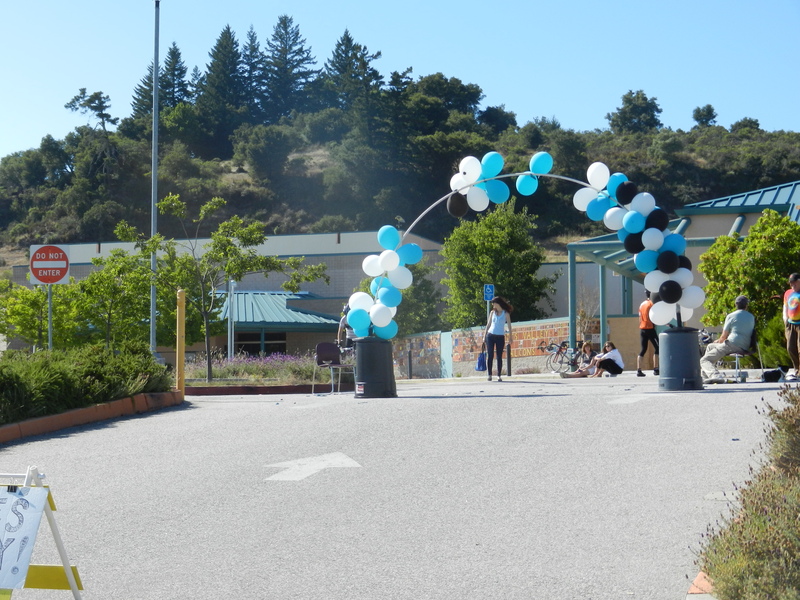 The SCMC starts and finishes at Scotts Valley High School located in Scotts Valley, CA. 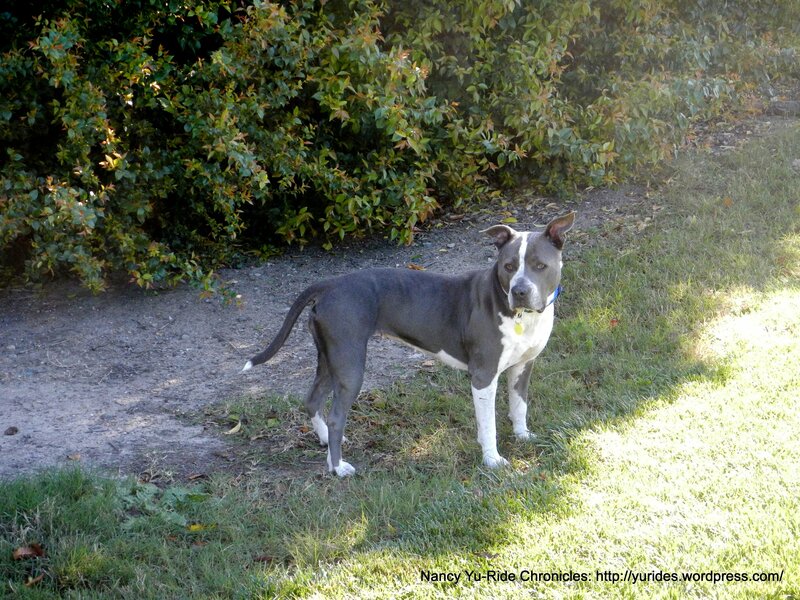 There is ample parking along with the full use of the schools’ restroom facilities. Free Peets coffee was being offered during the early morning check-in period. 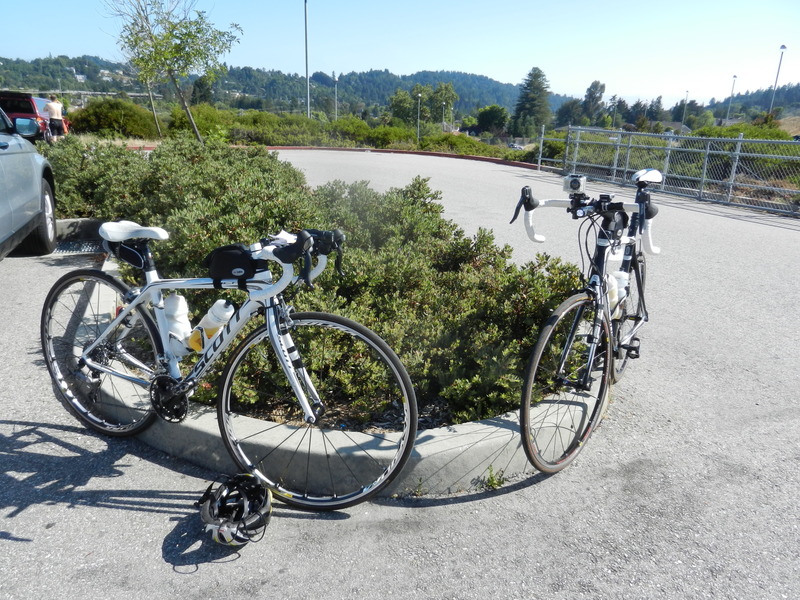 We already checked in the evening before at the Scotts Valley Hilton so all we have to do is get our gear ready and ride off. 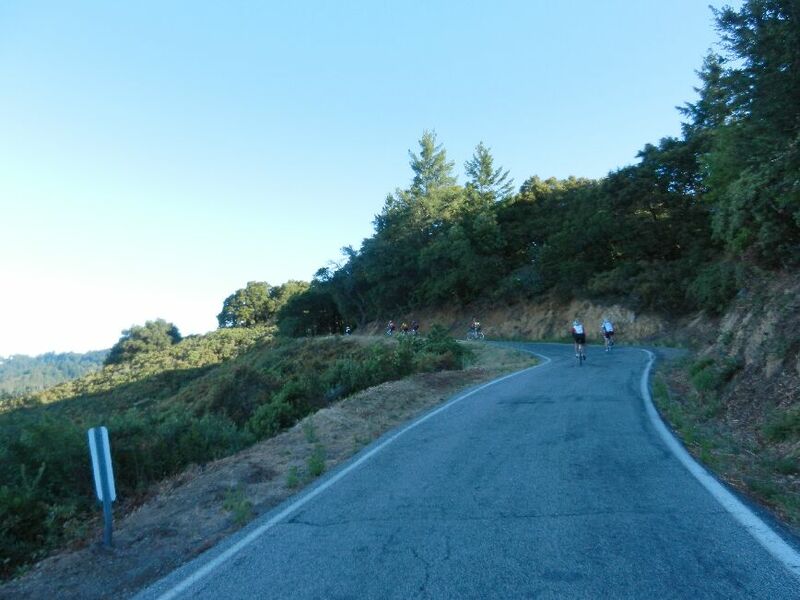 We exit Scotts Valley High and head north on Glenwood Dr for the next 2.3 miles. 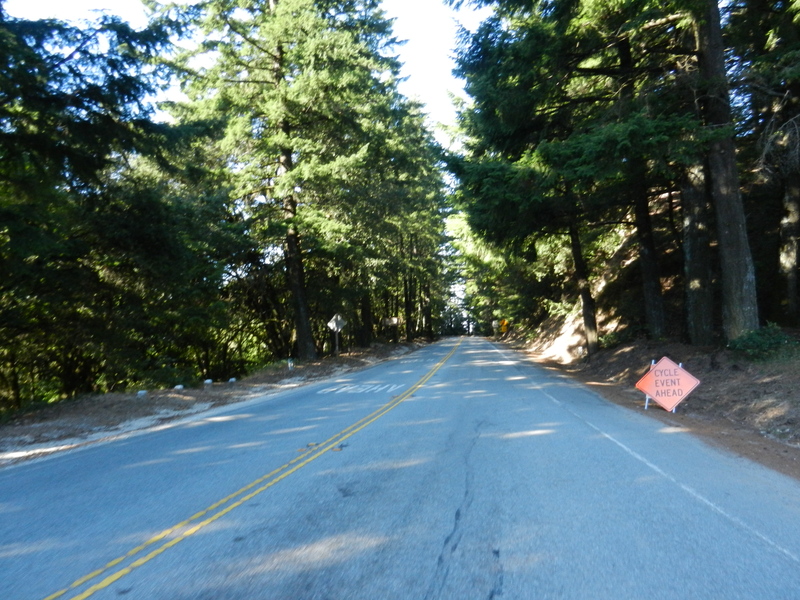 There is a short 5% climb before the road takes us on a slight down hill all the way to the turn on Mt Charlie Rd. 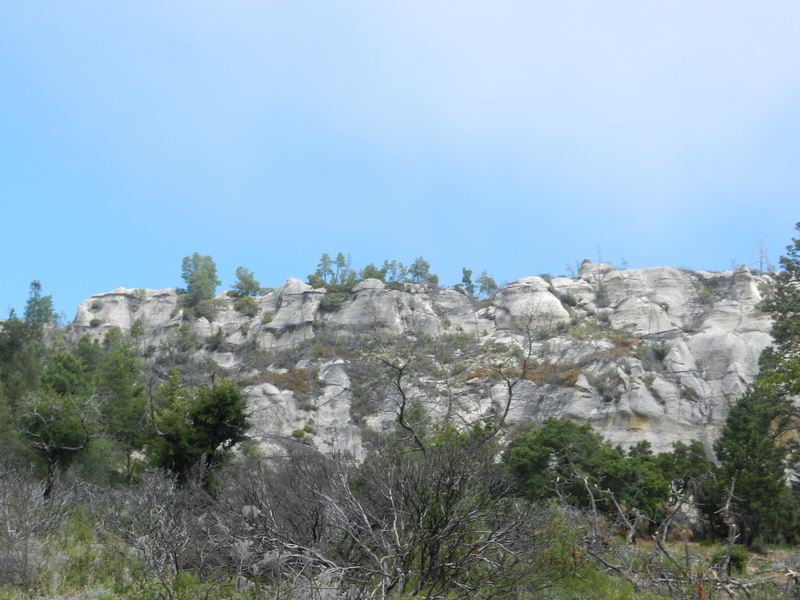 The climb on Mt Charlie is 4.2 miles long with an elevation gain of 1240 feet. The initial gradient starts off at around 6-9% and levels out for a short bit before the climbing starts up again. There are several steeper sections ranging from 12-15%! 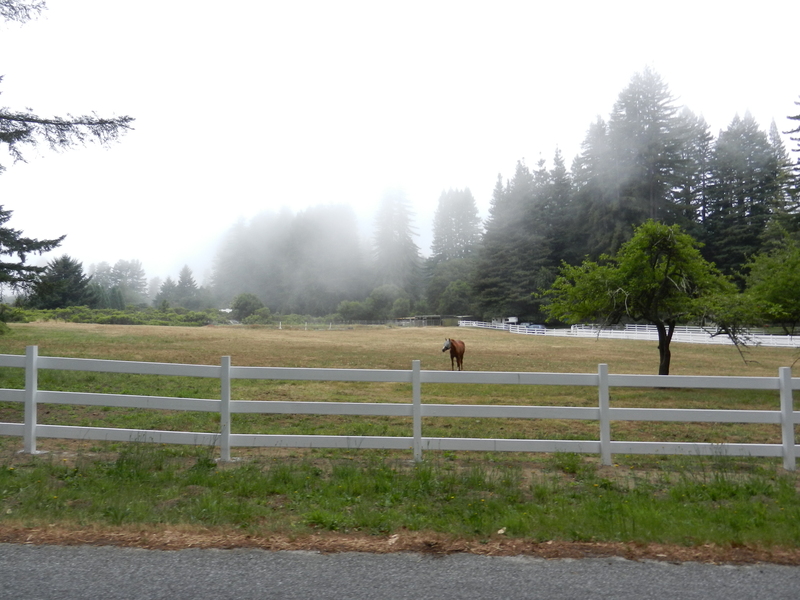 The early morning fog and mist sets the tone for a quiet and mystical experience. You can actually hear and see the condensed water dripping from the canopy of trees above us. It’s really beautiful back here! 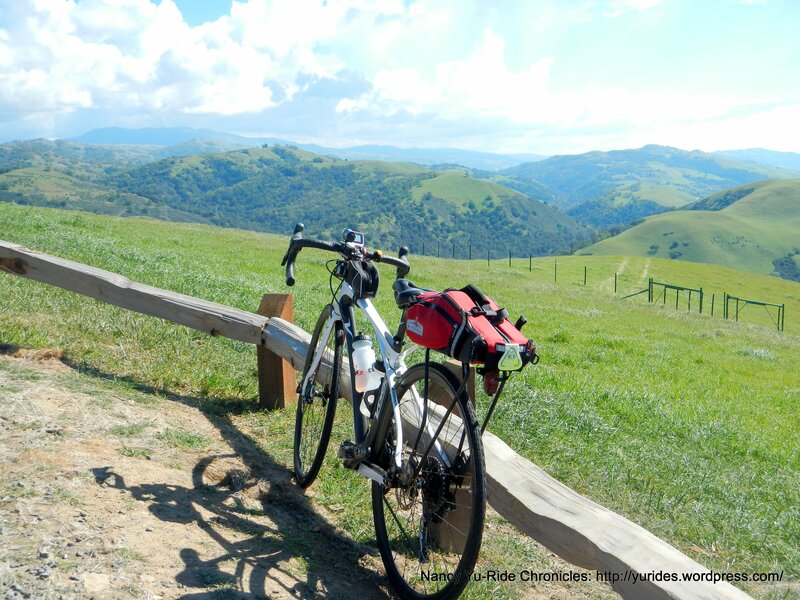 At the top of Mt Charlie, we take a left onto Riva Ridge Rd. Riva can take you by surprise; it starts off very gradual at around 4%, which is then followed by a nice descent. Then you get hit with a short steep 14-17% climb! The turn onto Hutchinson Rd takes you along a ridge line which passes through vineyards and horse stables. The sun is finally breaking through the dissipating fog as we reach Water Stop#1 at the intersection with Summit Rd. We continue north on Summit Rd for the next 2.3 miles on pretty flat terrain. It’s absolutely gorgeous riding along the top of the ridge. 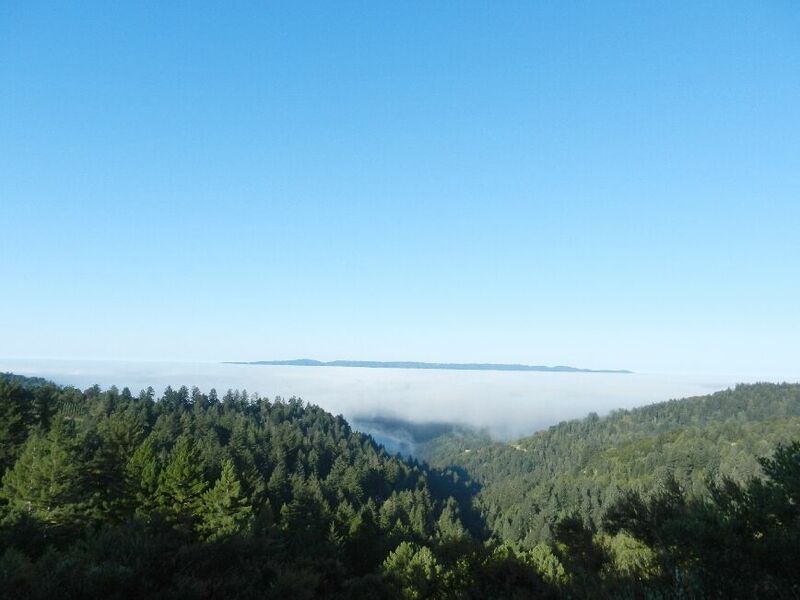 You can still see the thick blanket of fog covering the forests below us. The views are just outstanding! 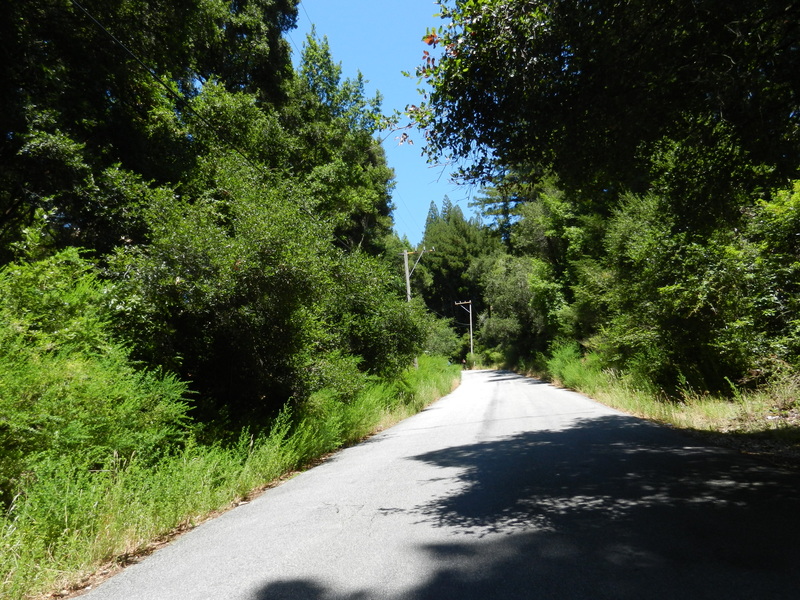 From Summit Rd, we continue on Bear Creek Rd and Skyline Blvd on Hwy 35. 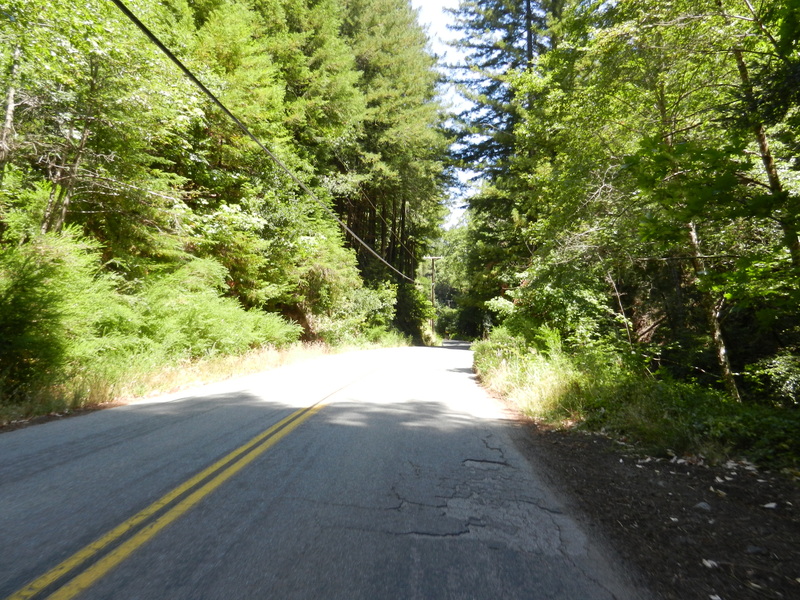 The average gradient on this narrow single lane road is at 4.5% with several steep sections hitting 9-11%. The single lane changes to two lanes after crossing Black Rd. 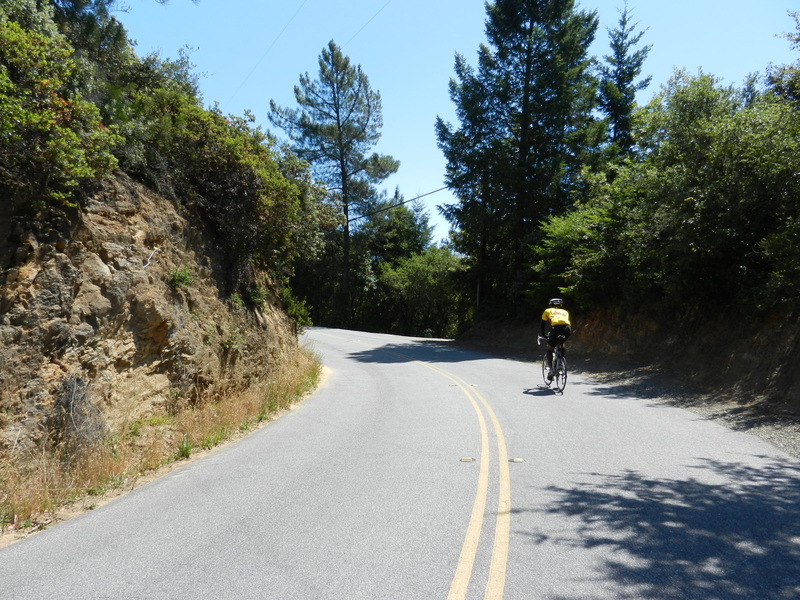 We stay on Skyline Blvd/Hwy 35 for 10.2 miles on nice smooth pavement. The gradient ranges from 3-7% with sections that level out at 1-2%. 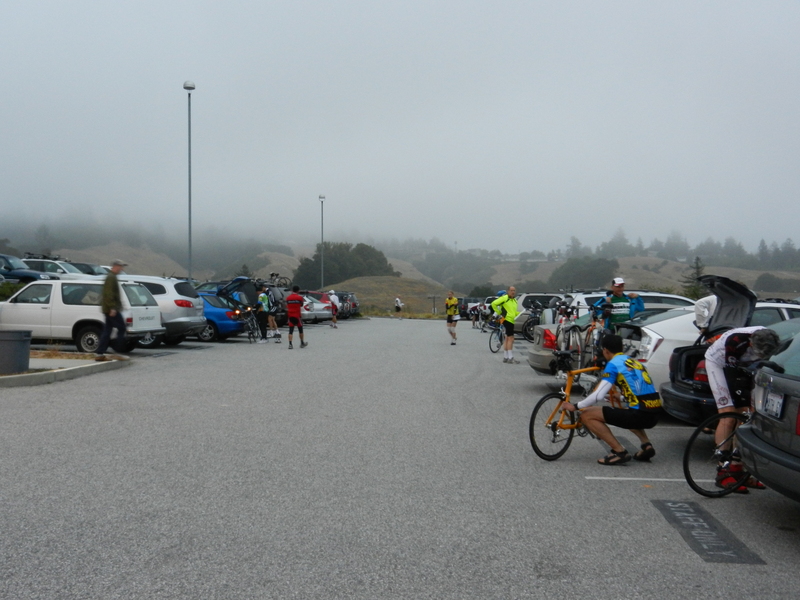 We arrive at Rest Stop#1 at Skyline & Hwy 9, mile 20.3, 3500′ elevation gain at 8:22 AM. 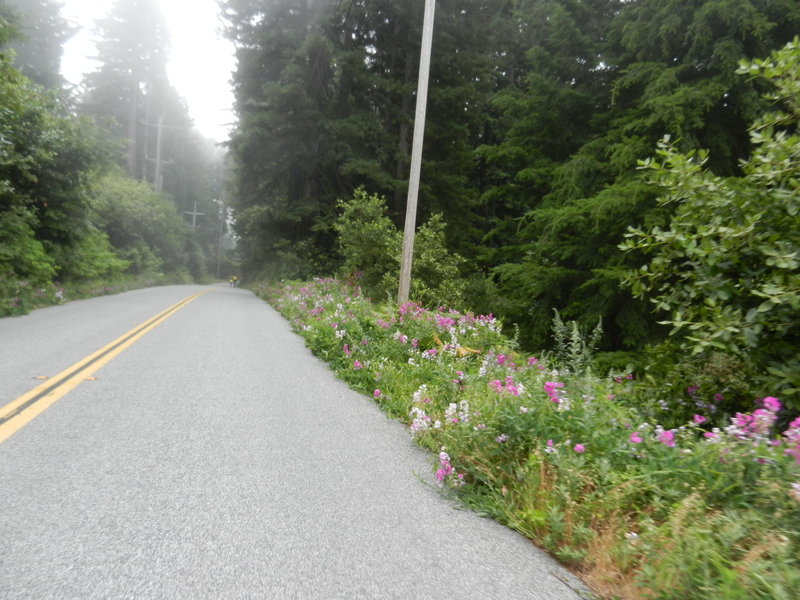 On Hwy 9, we get a nice 6.1 miles sweeping fast descent on smooth wide pavement all the way to Hwy 236 and ride right back into the light fog. 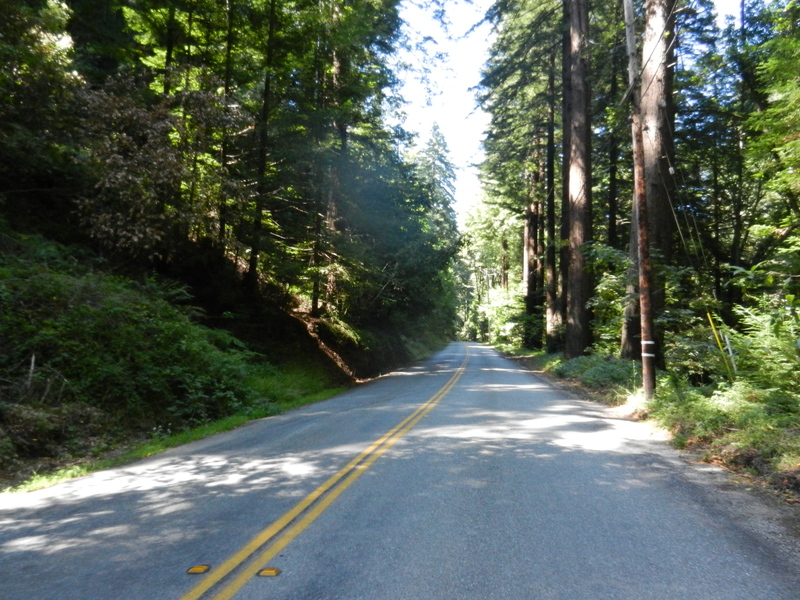 We stay on Hwy 236 for the 11 miles loop that takes us through Big Basin Redwoods State Park. I definitely think this is the most beautiful part of today’s route. The redwood forest is amazing! 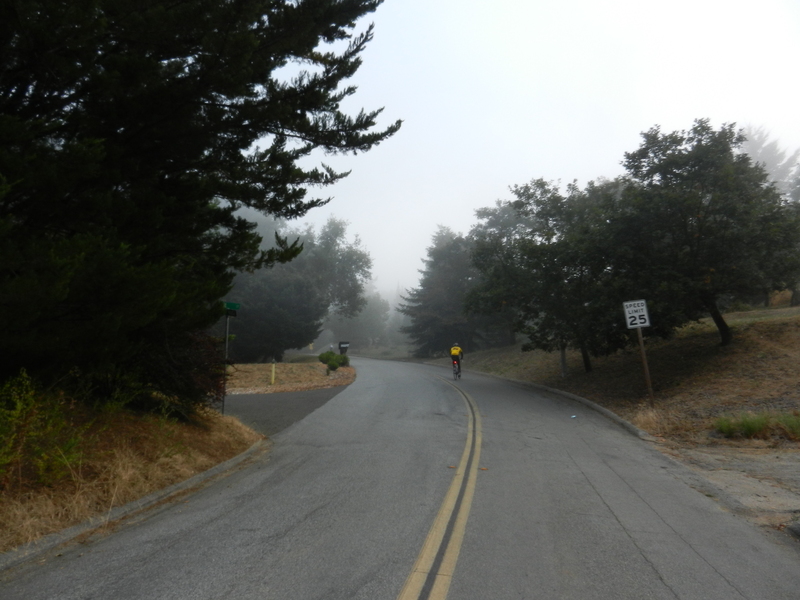 The gradient here ranges from 4-6% with a fun descent into the park. The gradient remains the same at around 4-6% as we exit the park on Hwy 236. 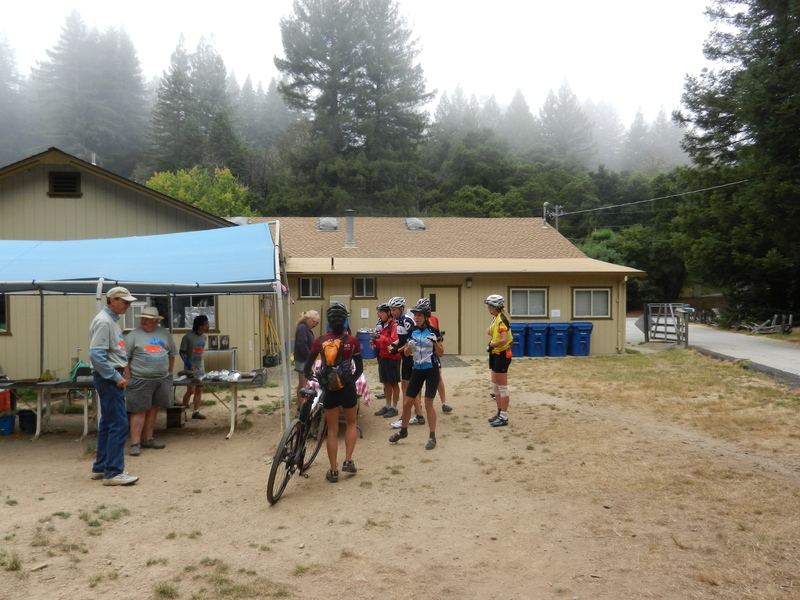 We reach Rest Stop#2 at Sempervirens Outdoor School, mile 37.4, 4933′ elevation gain at 9:48 AM. 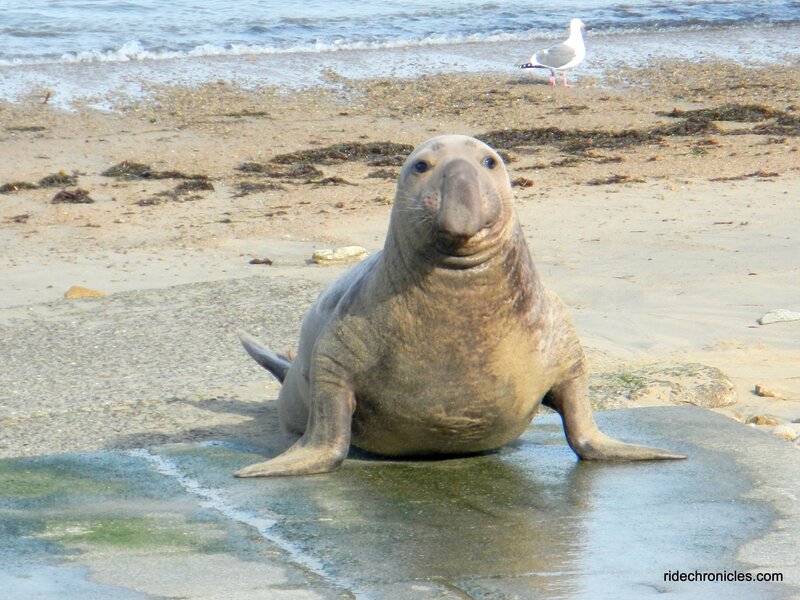 It was nice to see Brian K. here. 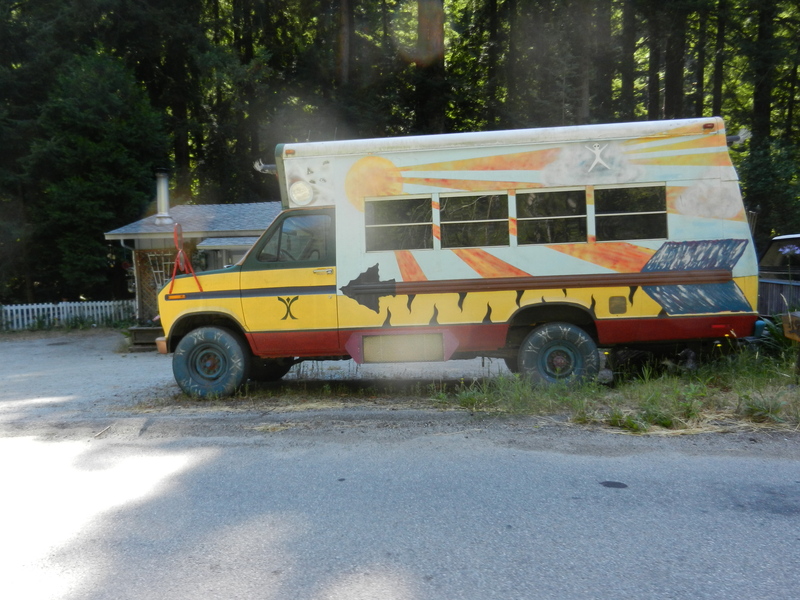 We stay on Hwy 236 to Jamison Creek Rd. 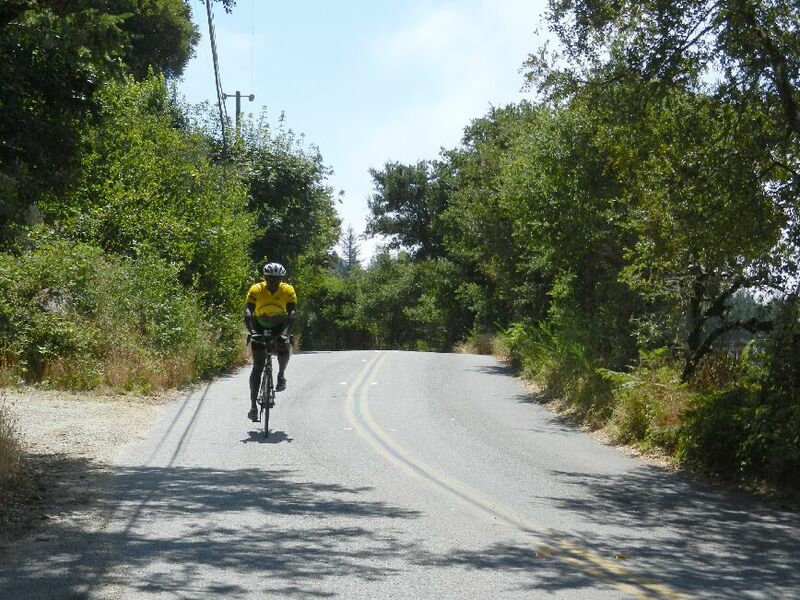 At the base of the climb, I call out my number to start the TT up Jamison. Never mind the TT, I just want to get to the top without feeling wasted! 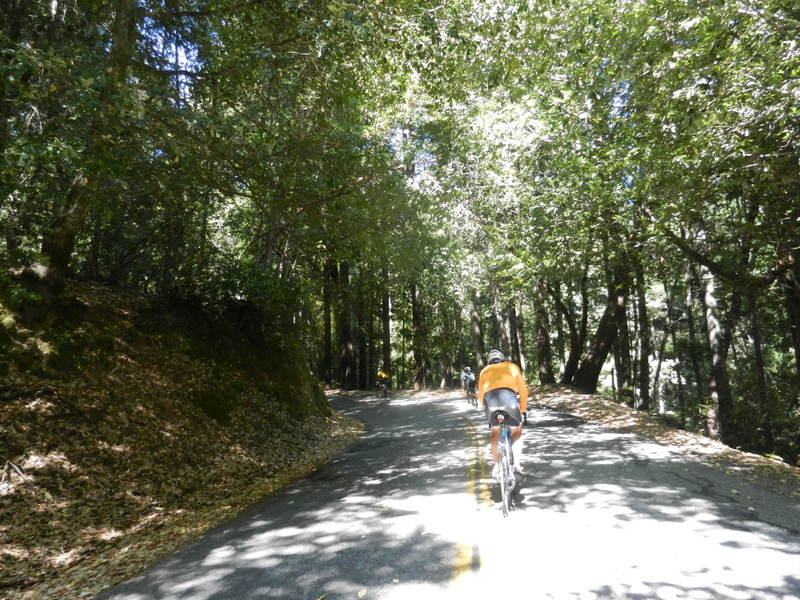 It’s a 3 mile climb with 1505′ of elevation gain. 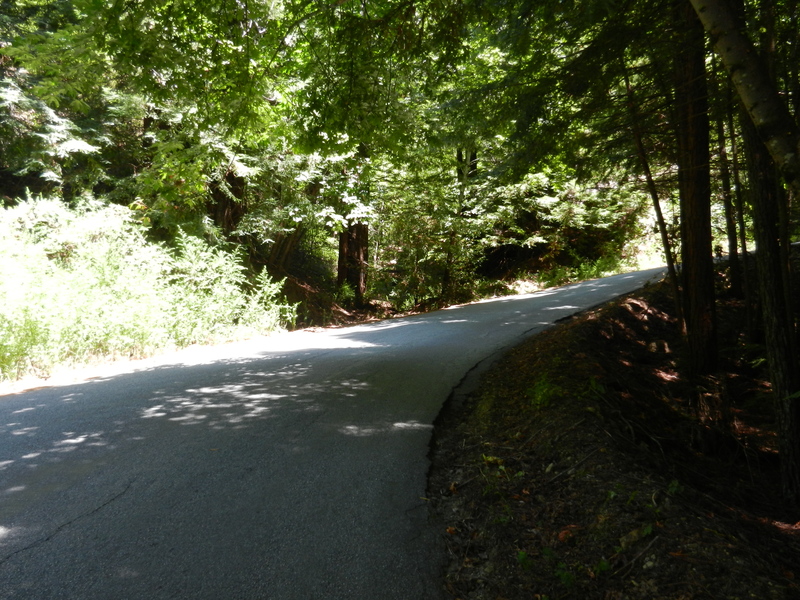 The gradient starts off gently at 3-4% then 6%… and just gets steeper as the road continues on. A majority of the climb as you near the top stays in the double digits range; 10-15%, so reaching the summit is a welcome sight! It’s sunny and warm at the top of Jamison; Water Stop#2. I call out my number as I pass the TT timekeeper. Michael and I share a can of Mountain Dew, that should help get us to the lunch stop. It’s great to get a warm welcome from Ken E., he’s a volunteer for this event. 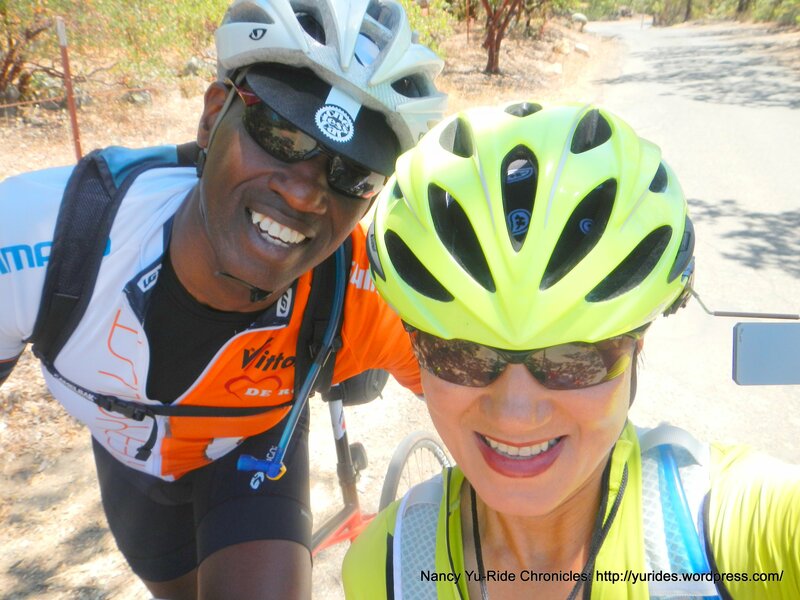 Michael makes new friends with Marcela and Peter; they’re both riding their heavy low gearing mountain bikes. 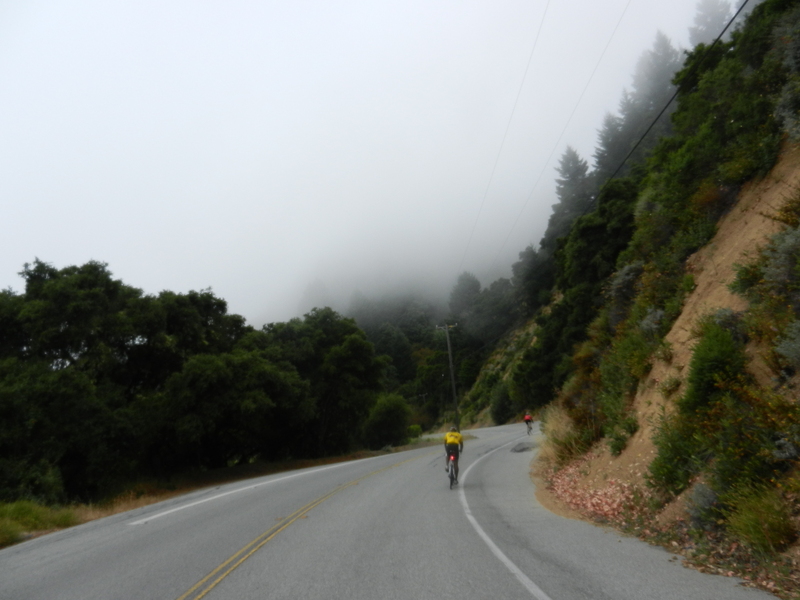 We continue south on Empire Grade for the next 1.5 miles on slightly rolling terrain. The views are fabulous! 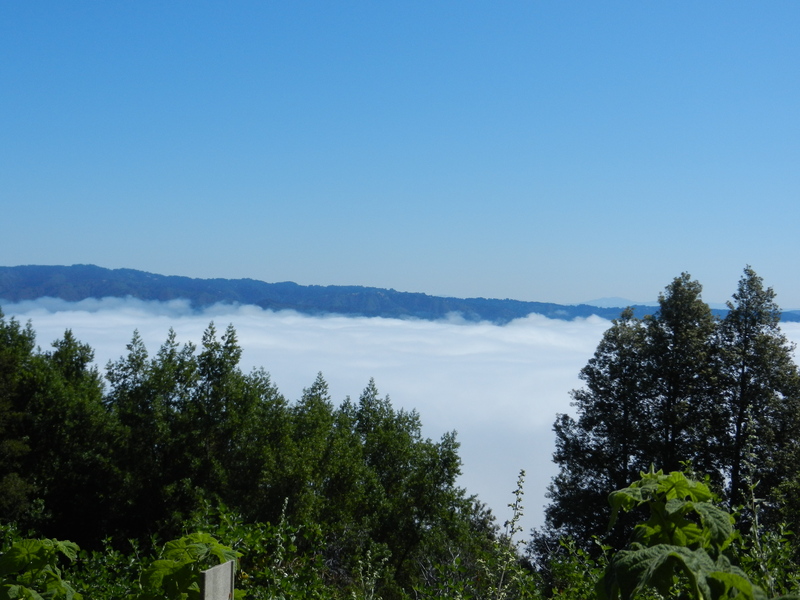 The thick blanket of fog is still hovering below the ridge. 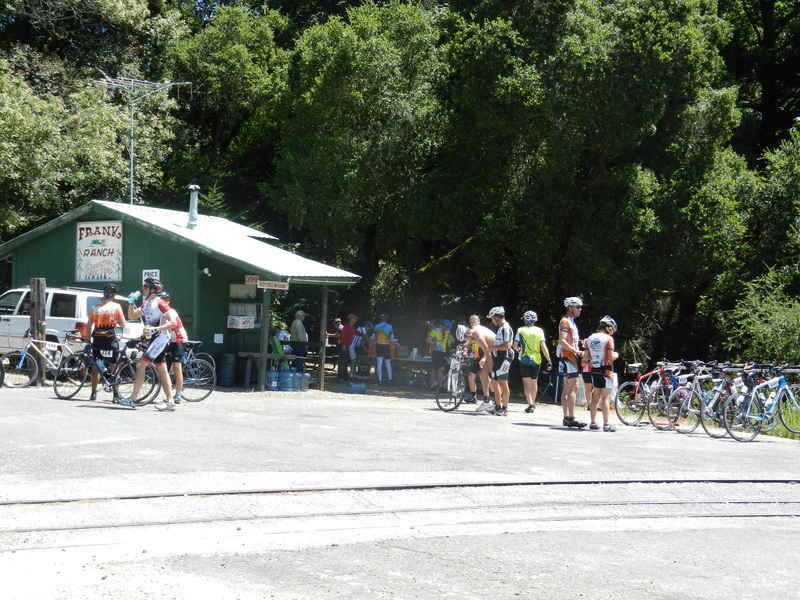 We arrive at Rest Stop#3/LUNCH at the Ben Lomond Training Center-CDF, mile 45.7, 6795′ elevation gain at 11:05 AM. I have half a turkey sandwich with lots of pickles, tomato and lettuce. I guzzle down a can of V8 and Coke too. We run into Ken E again along with his friends; Steve S and Lane. I also see Jack H here. 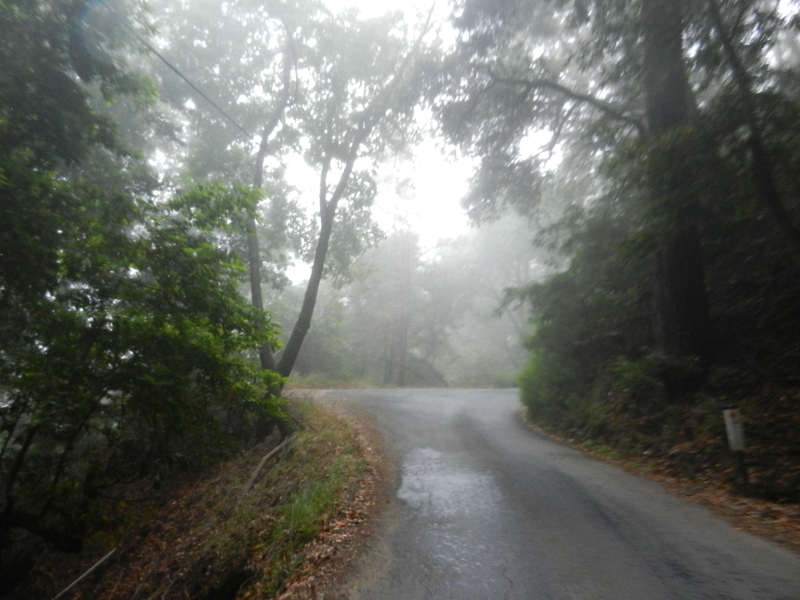 It’s a nice flat descending 4.4 miles on Empire Grade to our next turn. The 2 mile run along Pine Flat Rd provides us with a nice fast descent. The next turn onto Bonny Doon Rd is very easy to miss while you’re flying down the road; and that’s exactly what happens to alot of people! 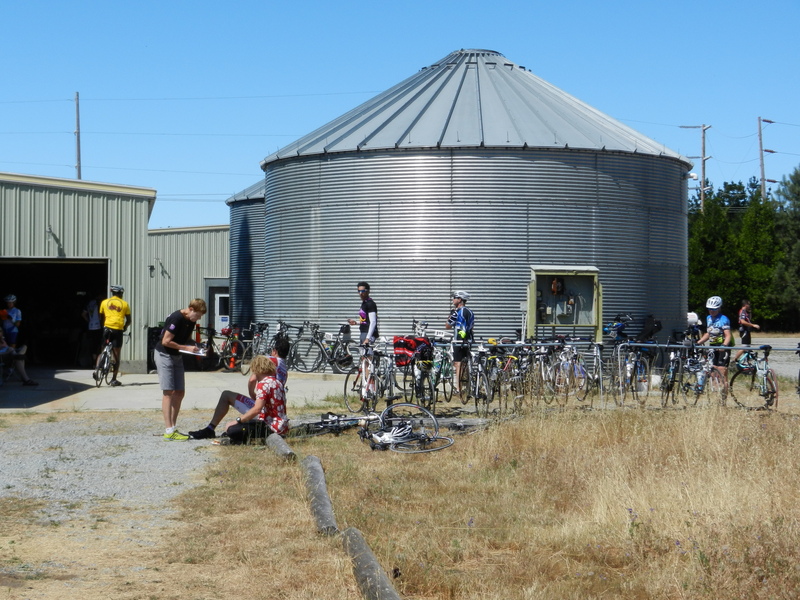 We stay on Bonny Doon for the next 2.9 miles. 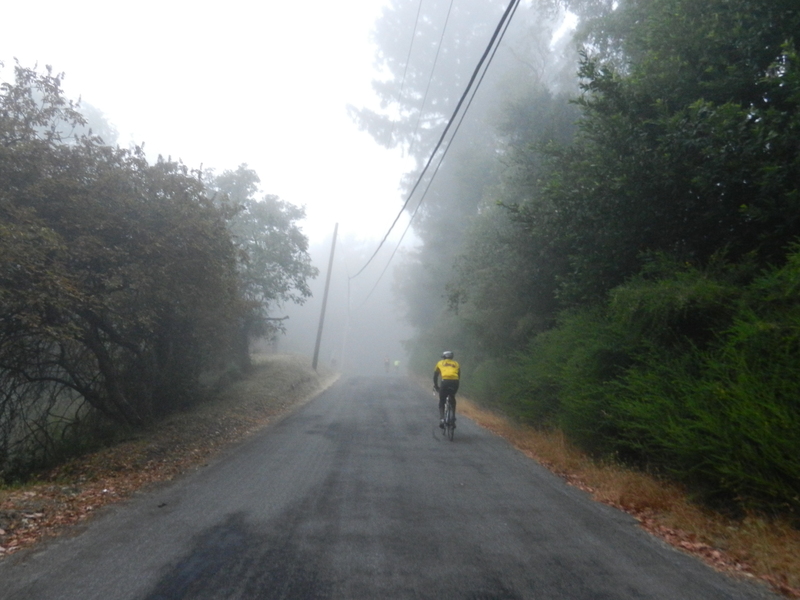 We’re riding into some coastal fog as we make the slight climb and gradual descent back to Pine Flat Rd. It looks colder than it is, it’s actually very humid. 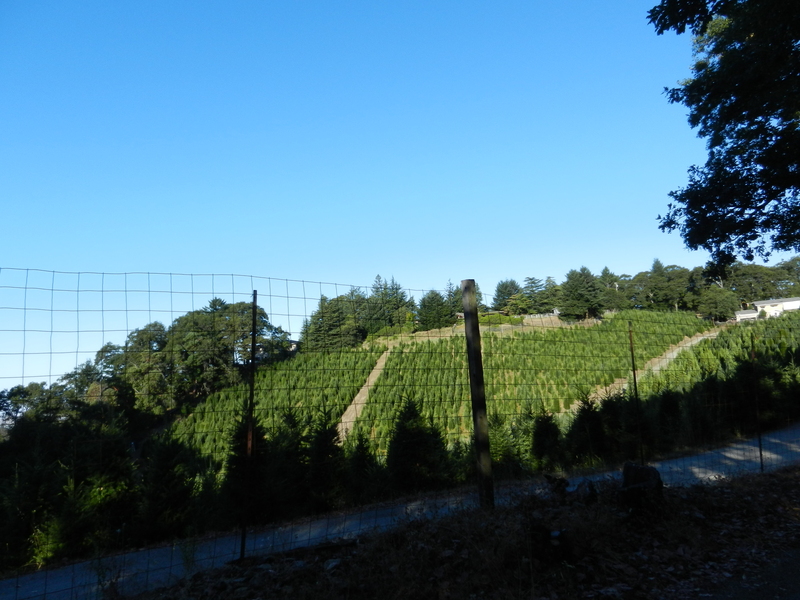 There are vineyards and horse ranches hidden along this quiet back road. 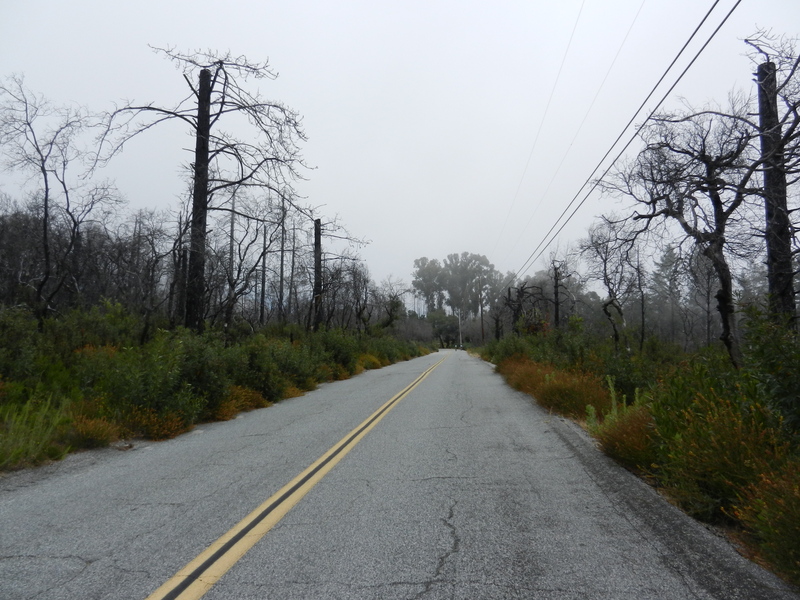 We get back on Pine Flat Rd heading north and continue on Martin Rd for the next 1.7 miles. There is a short 7-11% climb followed by a steady grade of around 5-6%. 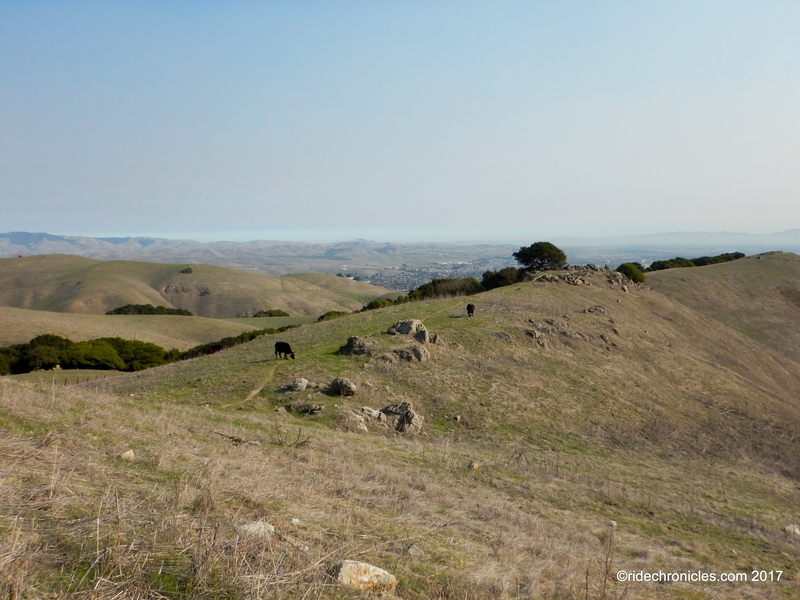 This area was affected by the Santa Cruz wildfire back in 2009 and you can see the residual effects. The burnt trees against the overcast skies just gives this whole place an eerie and dramatic feel to it. 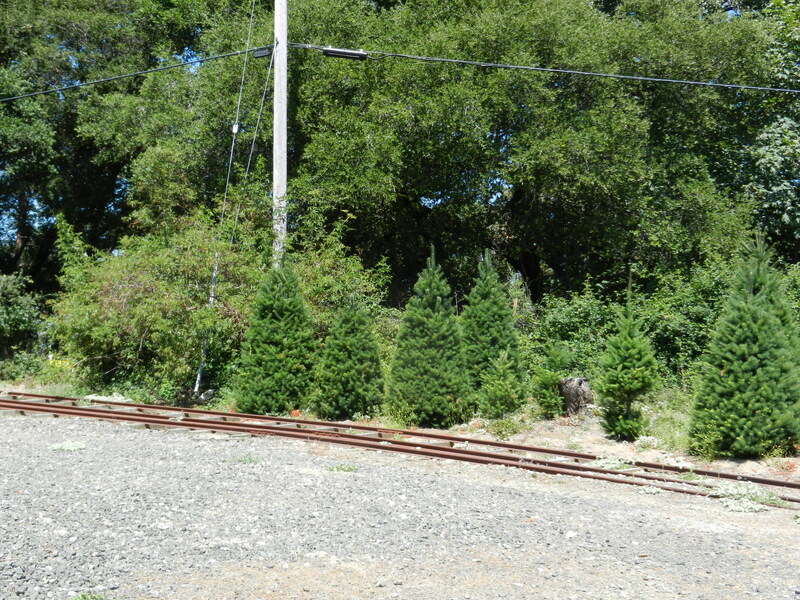 We make a right onto Ice Cream Grade and the sun is peeking through the redwoods; it’s absolutely gorgeous here! WOW! The 2 mile stretch here starts off with a nice descent followed by gradients of 3-4% and increasing to 6-8%. 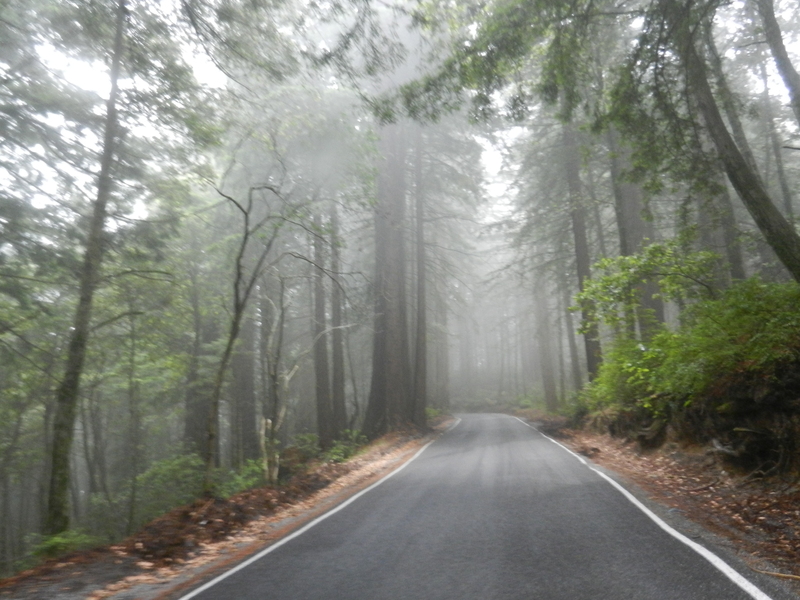 The road levels out as you exit the redwood forest. We cross Empire Grade and continue straight onto Felton Empire Rd. It’s a fast 3.8 miles descent on a single lane narrow road. 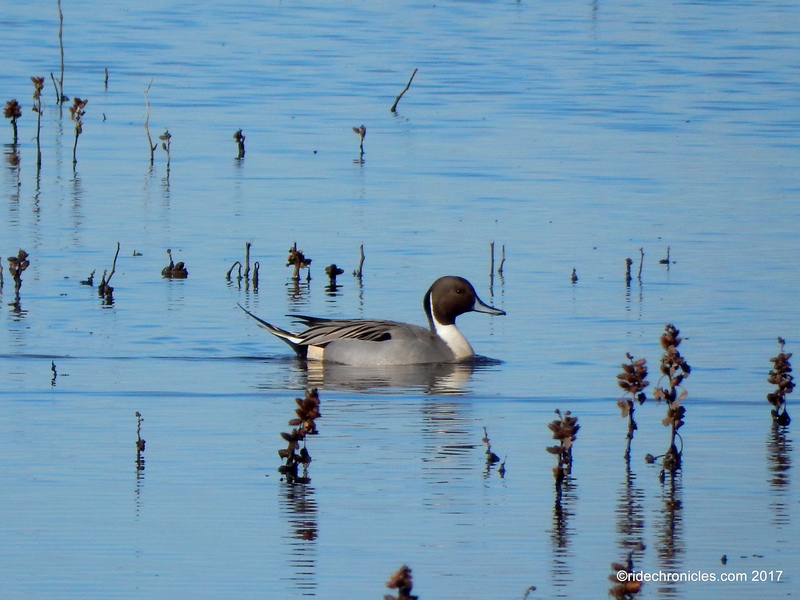 We drop down into the town of Felton and cross Hwy 9 to Graham Hill Rd. 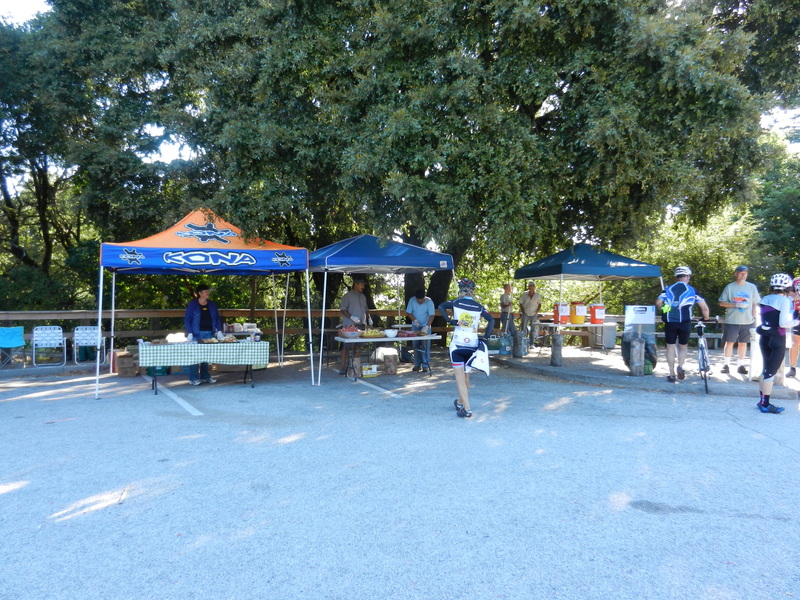 The unmanned Water Stop#3 is located at Felton Covered Bridge Park. An outhouse is also available here. 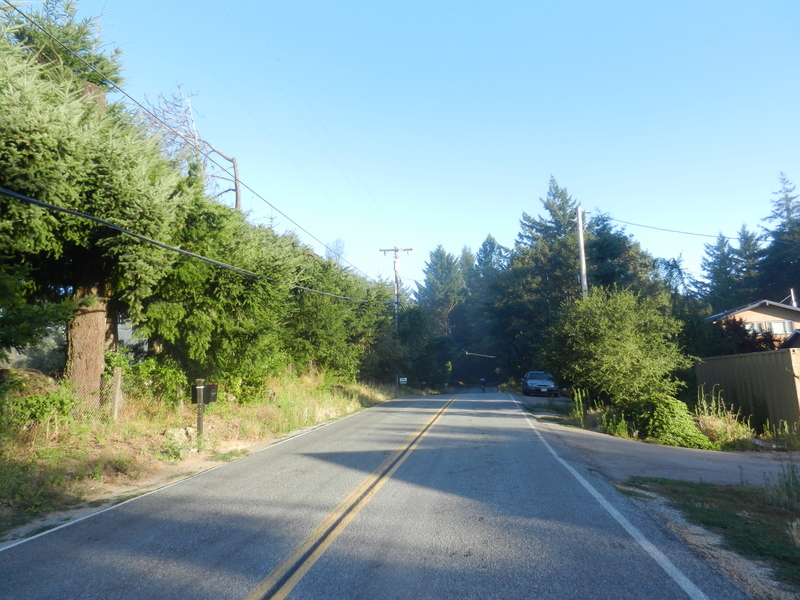 There is quite a bit of traffic going through town; watch for cars as you make the left turn onto E Zayante Rd. 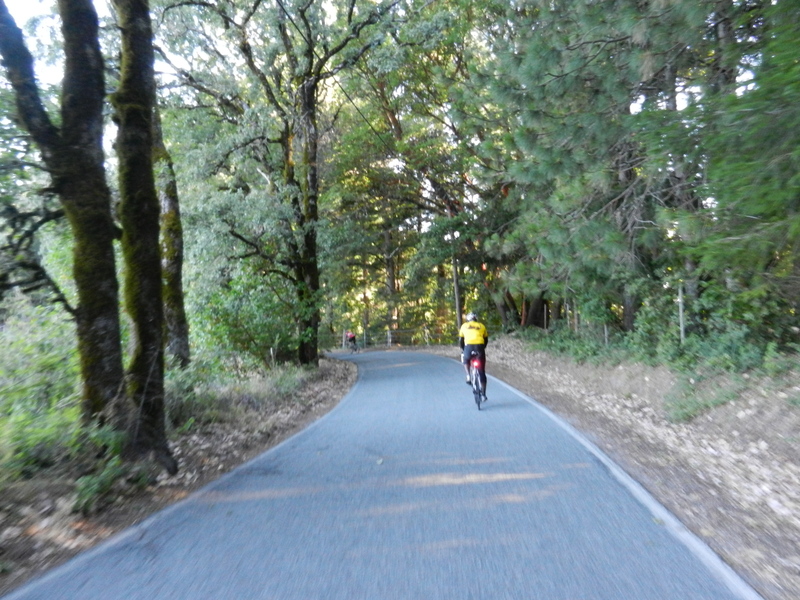 We make a few turns on W Zayante to Quail Hollow. 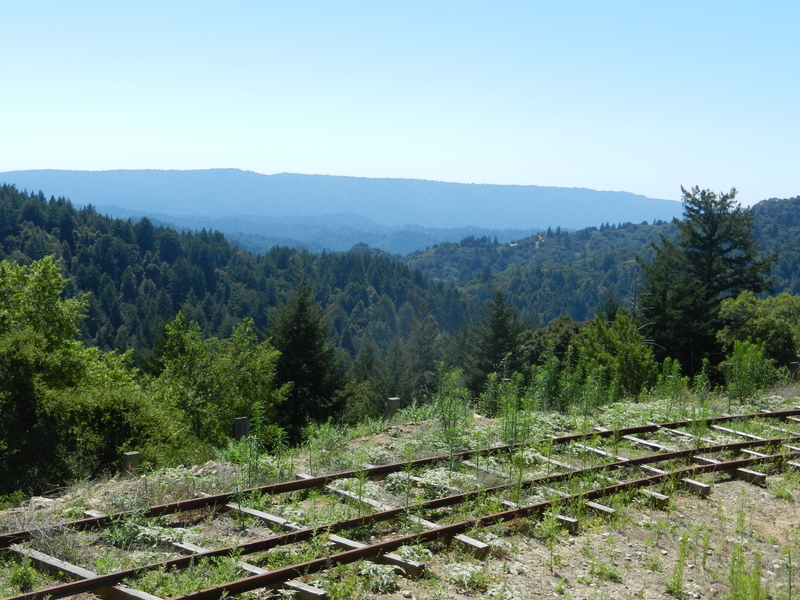 There is a slight incline of 2% here followed by a down hill; you can hear the rustling of the water along the creek and see the train tracks for the Roaring Camp Railroads. 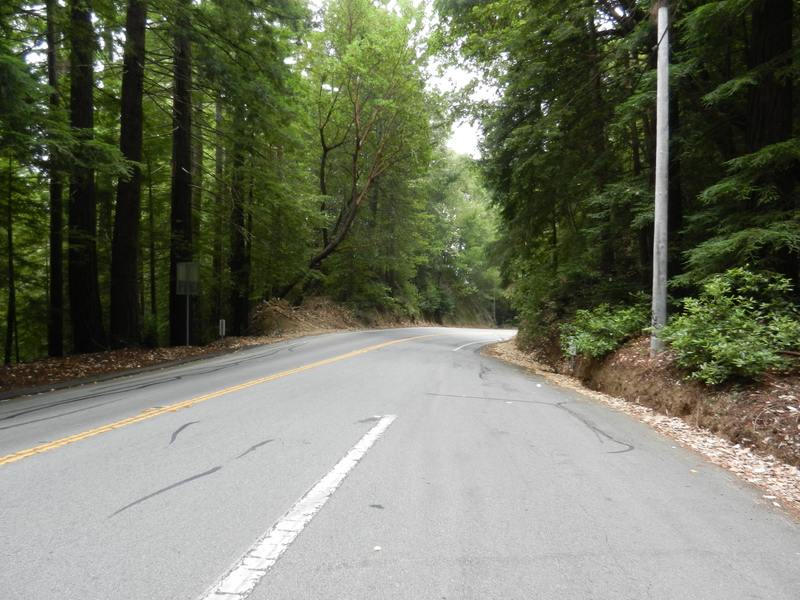 We’re back on E Zayante Rd for the next 6.6 miles. 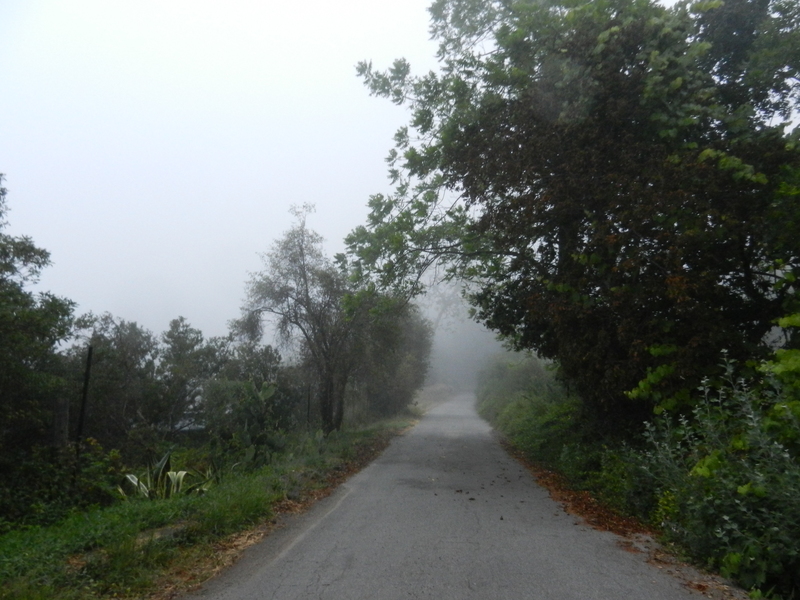 It’s a flat start followed by gradient ranges of 6-8% and just gets steeper as the road continues on up. The steepest sections range from 10-12% and maxes out at 15%!. It’s great to be on roads with minimal to no traffic around! 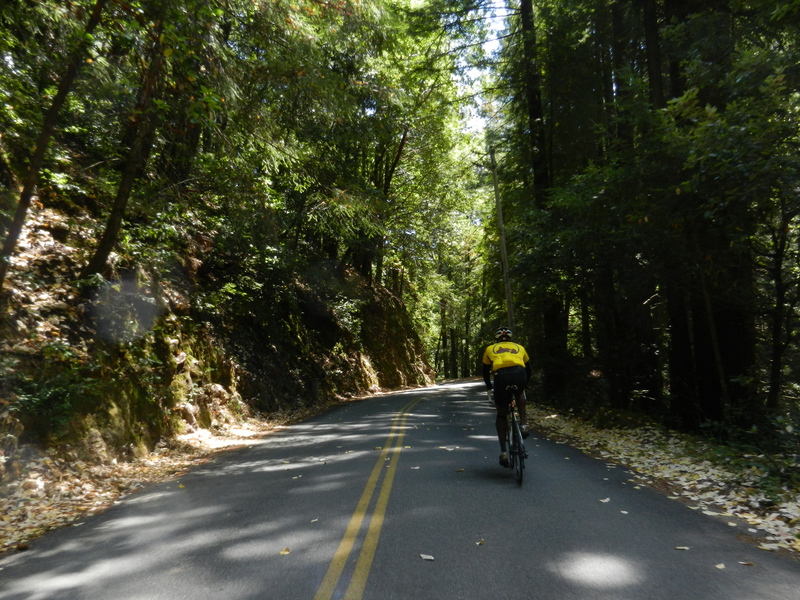 Upper Zayante Rd is 1.9 miles of sustained climbing with an average grade of 5.6%. There are several sections that hover around 9-11% and one switchback in particular that max out at 19%! It’s great to see Ken out there supporting us again! 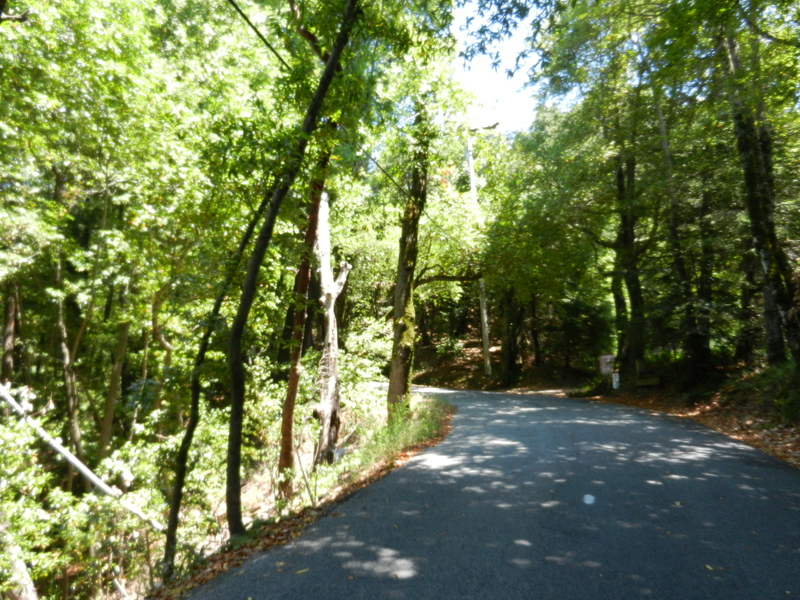 Many sections of this climb are shaded under a canopy of trees. We reach the top and make a right onto Summit Rd. 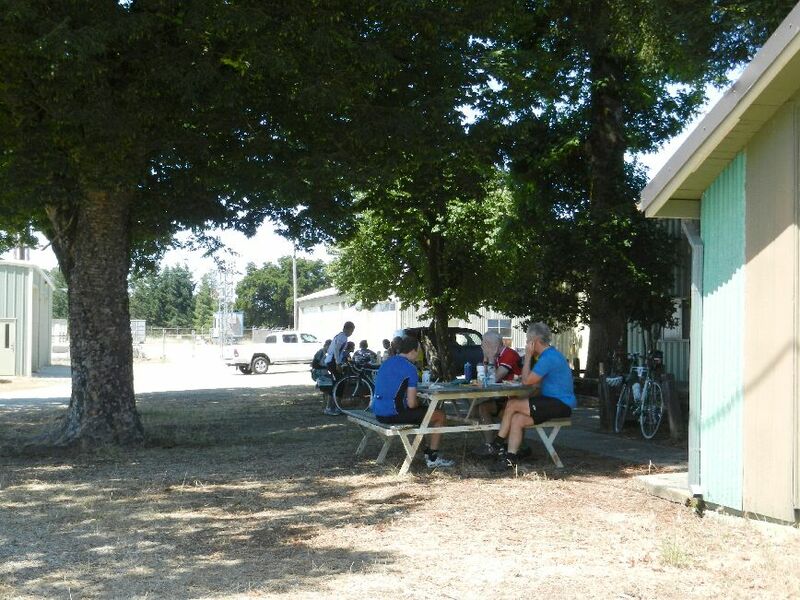 We arrive at Rest Stop#4 at Frank’s Christmas Tree Farm, mile 78, 9769′ elevation gain at 2:25 PM. 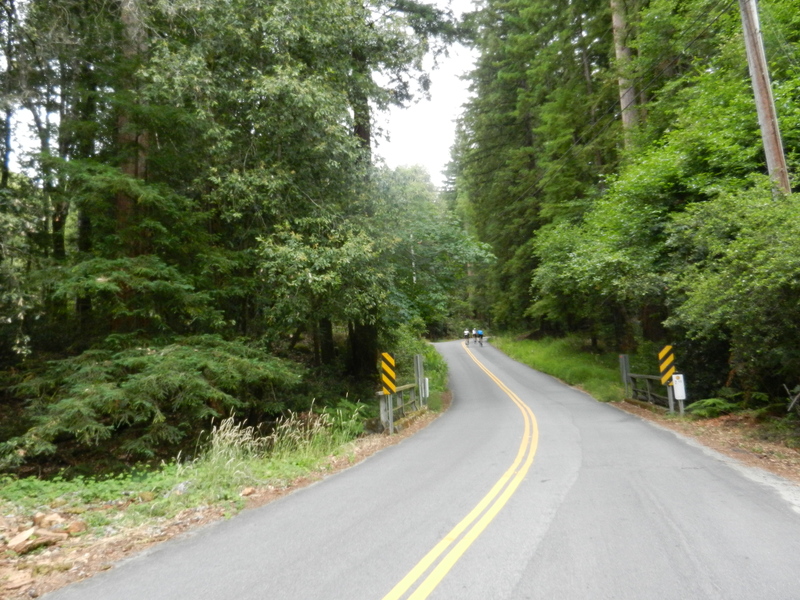 We head south on Summit Rd for the next 1.6 miles and cross Hwy 17 to Old Summit Rd. Old Summit Rd takes us on a slight detour back to Summit Rd. We continue south on Summit Rd for the next 3.2 miles on pretty flat terrain with a few short climbs in between. 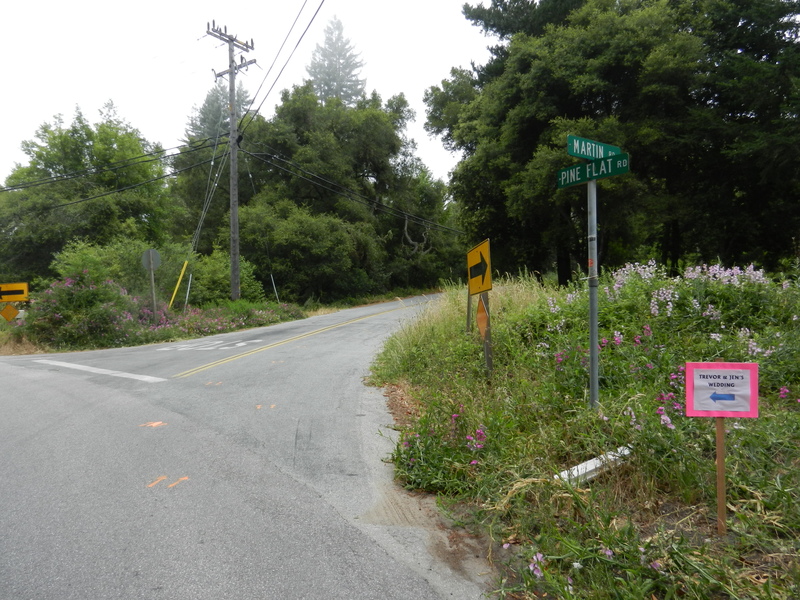 The route continues right on Soquel San Jose Rd. 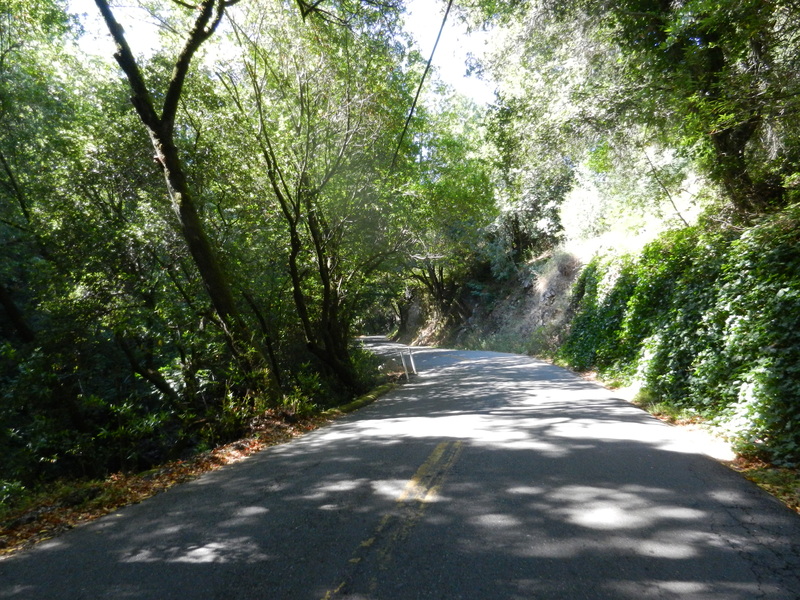 It’s a fun and fast 8.1 miles descent to our next turn on Laurel Glen. 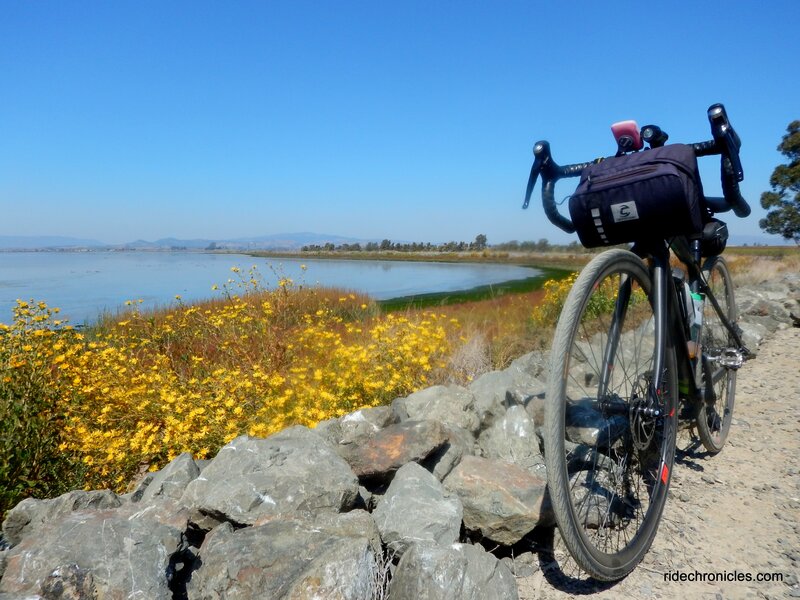 We were told at the last rest stop to watch for a huge pothole around the 5.34 mile mark that was causing flats for many cyclists. As we passed it, there were several folks pulled over on the side of the road doing flat repairs. Laurel Glen Rd is 2.2 miles with an average grade of 3.2%. It’s a nice quiet road with minimal traffic. The gradient increases to a steady 9% as you near the top and maxes out at 12%! We arrive at Water Stop#4 at Mt View Rd. The fun 0.9 mile descent on Mt View Rd takes us to another slight down hill on Branciforte Dr.
It’s only another 4+ miles back to the finish. We reach the final climb of the day on Granite Creek Rd. It’s 3.4 miles long with gradients ranging from 6-9% along with several steep pitches hitting 10-11%. 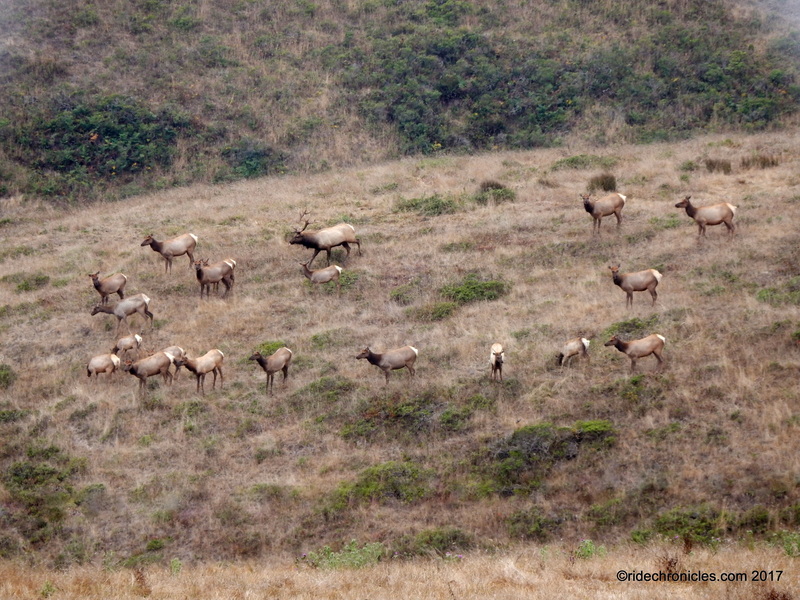 Granite Creek drops us back to Scotts Valley. Watch for all the traffic as you make the left onto Vine Hill School Rd. 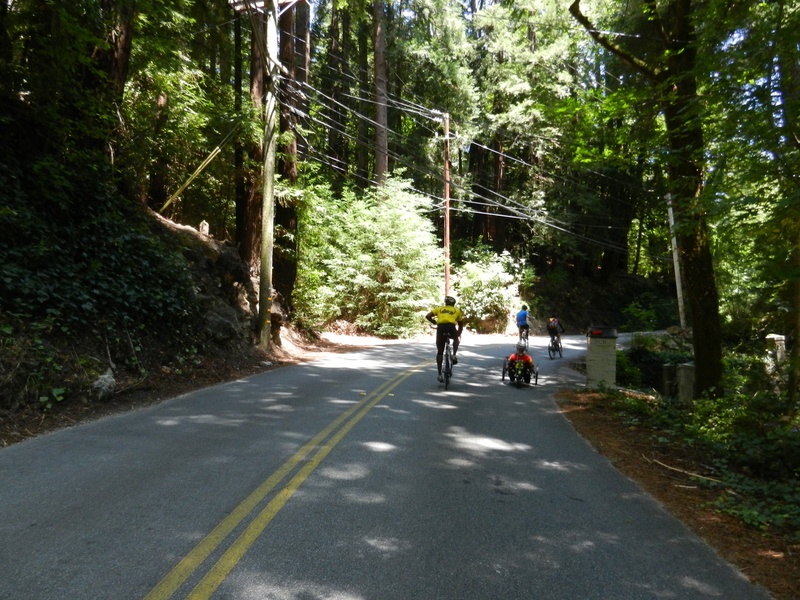 We turn on Glenwood, but wait; the last climb of the day is actually up the 9% driveway back into the High School! We ride up through the banner of balloons and hear the sounds of clanking cowbells to welcome us back. We finish at 4:30 PM. 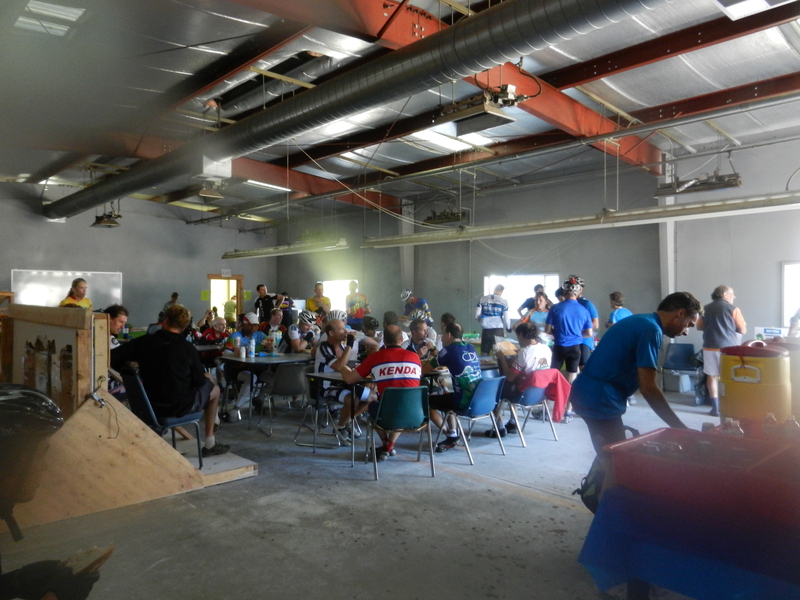 There’s more than enough time for us to put our bikes away and clean up a bit before we head inside for the post ride meal. We get to sit down and enjoy a burrito with fillings of your choice from Taqueria Vallarta and locally made ice cream from Marianne’s. Everything was delicious including the huge sweet strawberries and cold iced tea from Peet’s. We also run into Mike K and Jeff at the finish. It was also fun to watch a continuous video loop of the day’s ride put on by SCCCC. It was a wonderful ride with great support. 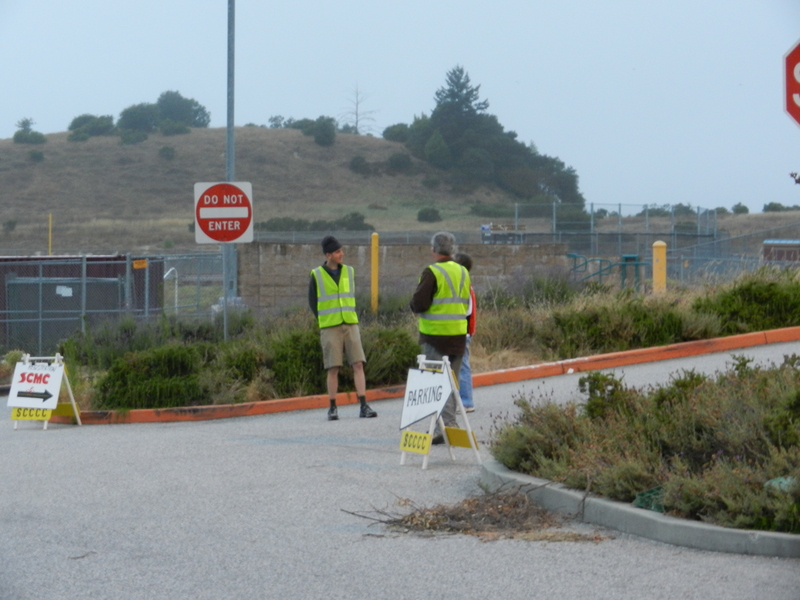 Thanks to all the SCMC volunteers for being out there and supporting us! 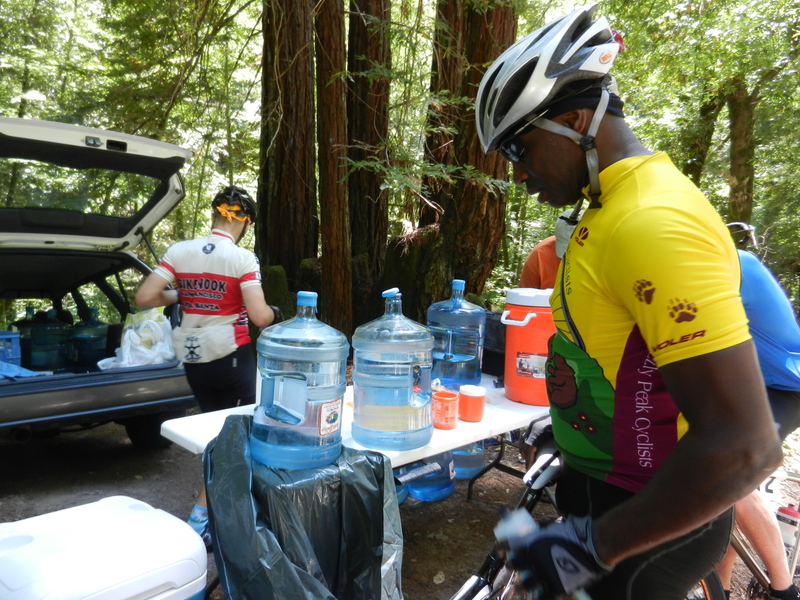 There were ample rest stops and all the water stops were placed at the just right spots! Today’s ride was not only challenging but also very scenic with stunning views. 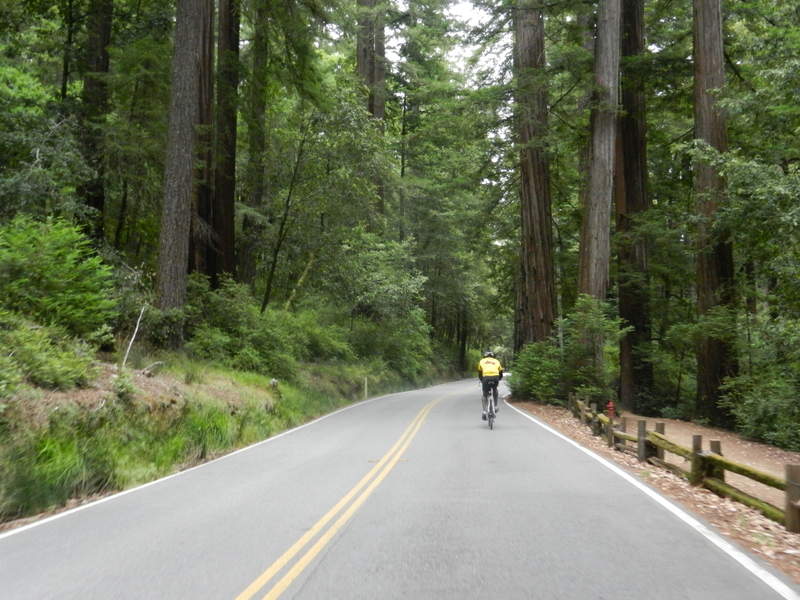 Riding through the many redwood forests and top ridges along the mountains was spectacular! 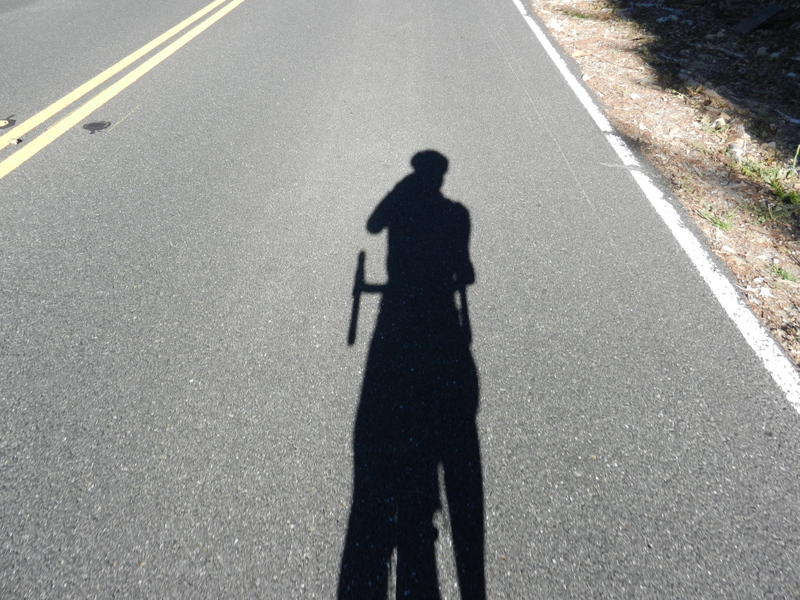 The majority of the climbs were on quiet country back roads with minimal traffic and decent pavement too. 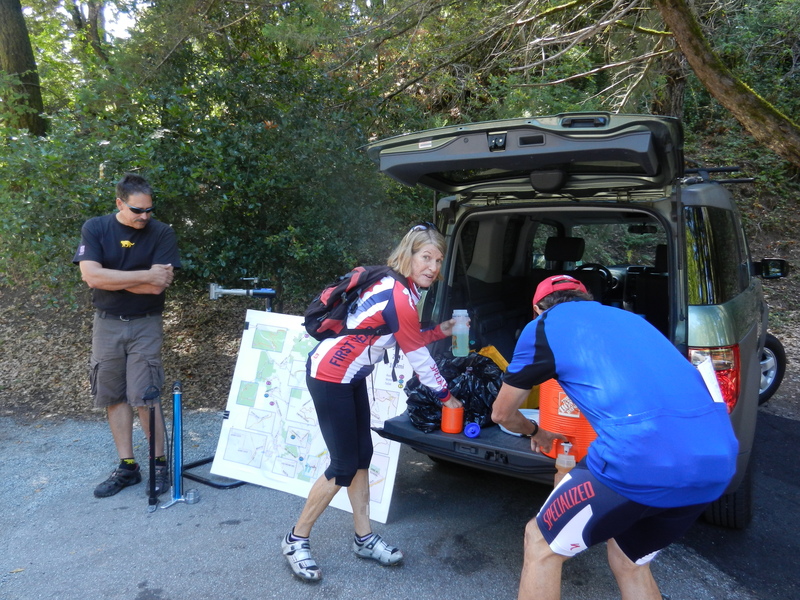 Next year, we’ll have to come back out and do the Double Metric route and enjoy more of what the Santa Cruz Mountains have to offer. Nutrition: Maltodextrin mix, lots of water, some Gatorade, a can of V8, Mountain Dew, Coke, a banana, a few crackers with peanut butter, zucchini bread, strawberries, half turkey sandwich with pickles, tomato and lettuce. 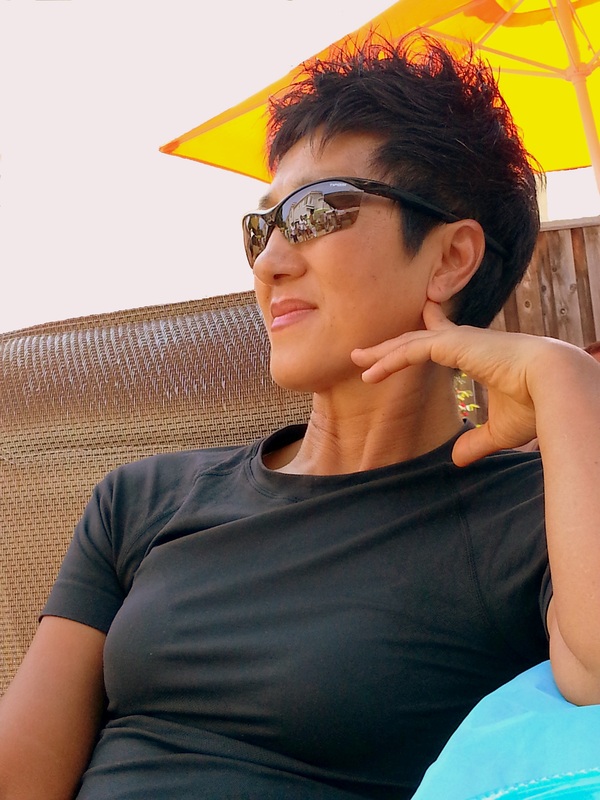 Fabulous blog! 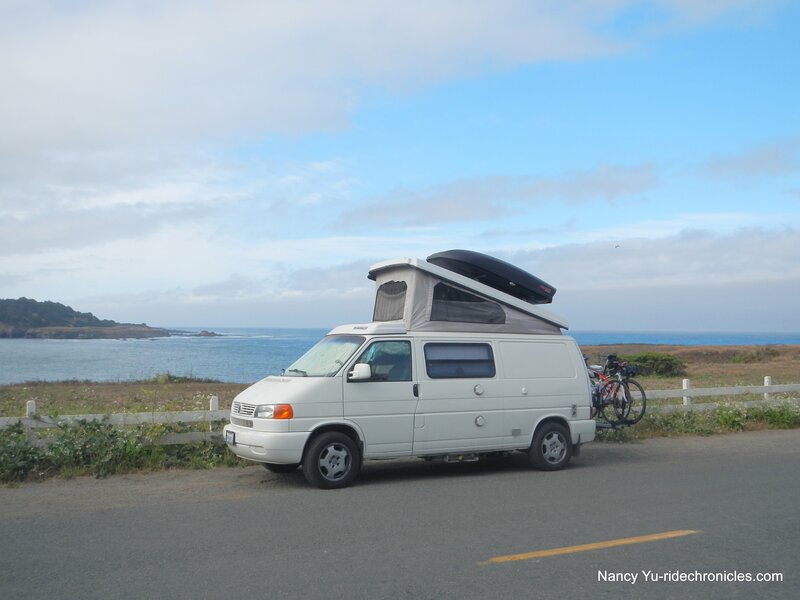 Thanks for sharing your adventure. Hope to see you on the ride next year. 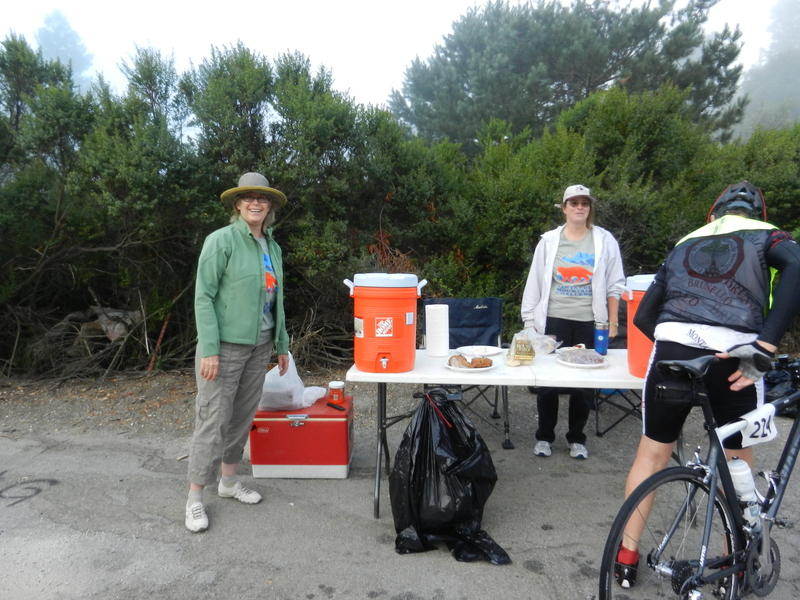 Best regards from Water Stop #1 volunteer. 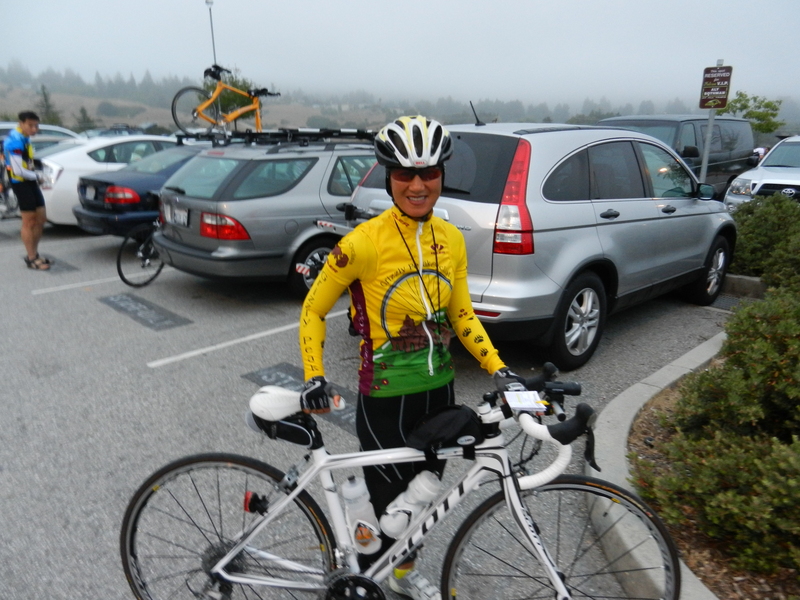 Sorry I missed seeing you on the ride, although I did see you on the video at Scotts Valley HS! 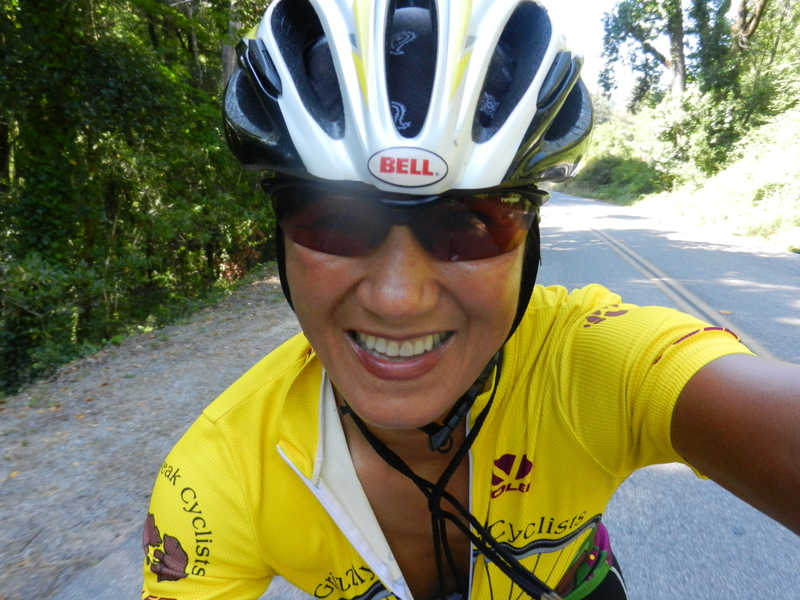 I felt the same way about the TT at Jamison — all I cared about was keeping a steady pace, up! Mt. Charlie is one of my favorite roads in the SCMs and this is the first time I’ve ever done it at the START of a ride — what a difference! 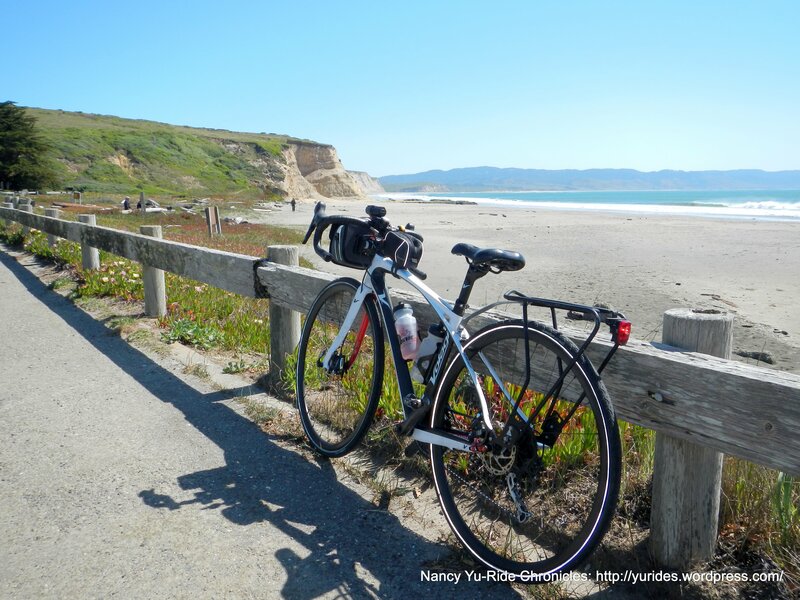 Ride safely and look forward to seeing you on a GPC ride soon!